Below you'll find some of the most creative designs on the market! 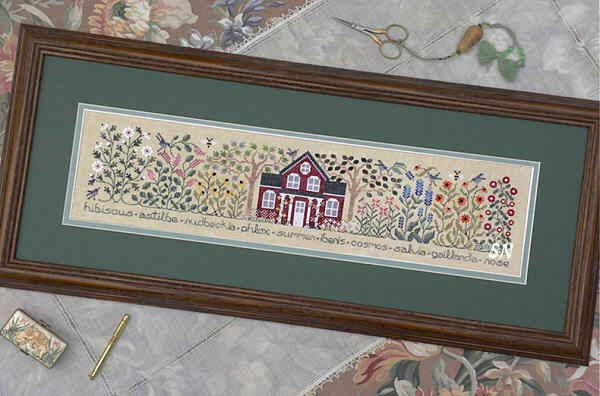 The Drawn Thread specializes in charming samplers with gardening, floral and restful themes. We have so many favorites, we're showing you some of them! Most have a fun stitch or two incorporated into the design. All call for linen... and frequently give you at least two appropriate choices. Some include a bundle of the silk threads needed to stitch the design, and all include any necessary charms. I just love all her tiny details... everytime I look at these, I see something new I missed the last time! Enjoy! Cynthia Zittel has three new designs - this one is my fav of the three. (Click the pic to see the others on her DT page). Always looking on the Sunny Side of the Street... this is a CHARMING neighborhood of houses, flats, apartments, condos, duplexes, hotels, bed and breakfasts, cottages and townhouses! I just love them all!!! 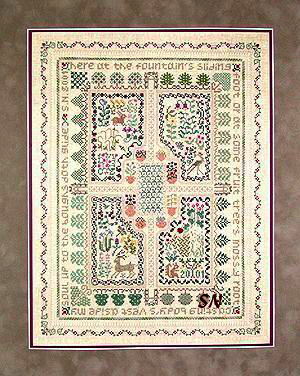 Presented as a chart, this is stitched on 32ct natural linen and finishes 4 x 20! 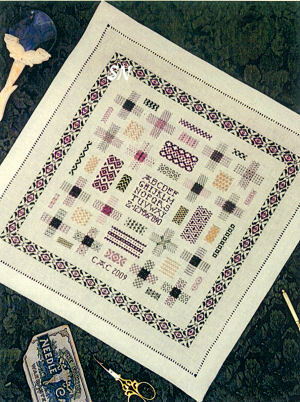 Charted for Silks... we have those available with the charts for a limited time. Lots of conversion charts out there on the internet, you'll be able to convert to cottons if you need to. You know this is stuffed full of Cynthia's cool and unique specialty stitches... just makes it more fun to stitch! 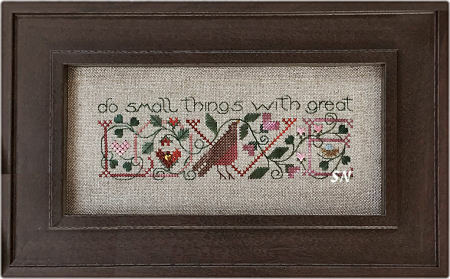 *Do small things with great LOVE* is the verse on this piece. 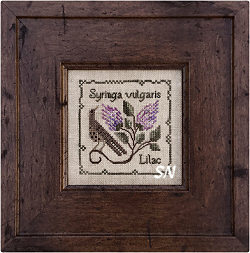 Stitched on 30ct natural linen with Dinky Dyes hand-dyed silks, it finishes a mere 3 x 6. 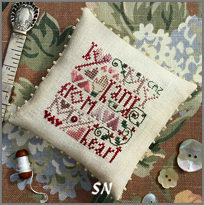 Just a bitty thing... it features special stitches and a tiny gold heart charm. It'd be very pretty finished into a round drum shape! Little bit of velveteen for the top... Presented as the chart, we have the silks available for this for a limited time. By My Hand from My Heart. 42 x 42 stitches. Click to see the framed version. 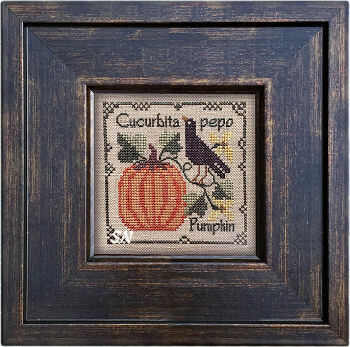 Pumpkin - Another of DT's Botanical Stitches, this is 'Cucurbita pepo.' 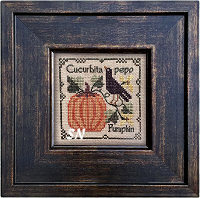 A perky blackbird atop and nice, perfectly shaped pumpkin, this measures only 54 x 54 in stitch count. Perfect as a small pin cushion, just yummy greens, golds and those pumpkin rusts. 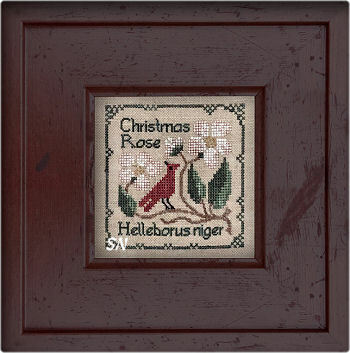 Christmas Rose - The next Botanical Stitches, this is 'Helleborus niger.' I'm not a botanist, so these remind me of Dogwoods and a little Cardinal... this measures 54 x 54, just like its companion Pumpkin chart. Silks are a dark forest green, brick red, creme and butterscotch in color. 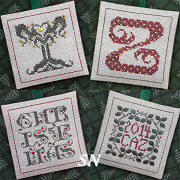 Christmas Cards - This is a set of 4 designs -- all offered together in one chart! *Good Tidings We Bring, To you and Your Kin, We Wish You a Merry Christmas, and a Happy New Year. 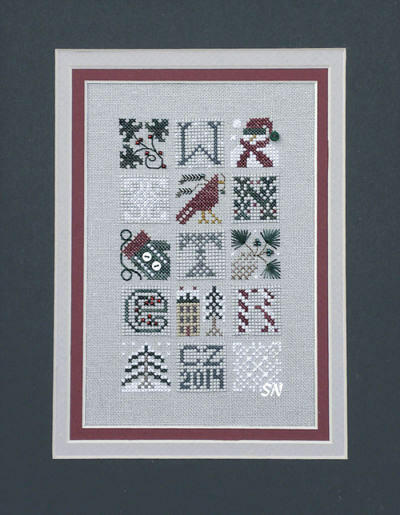 * Each 'Christmas Card' design measures 60 x 90 stitches -- approx 4 x 6 on 32ct. Coded for the silks (conversion site noted on chart for other threads) our charts come with a smattering of Mill Hill glass beads and a little burgundy button embellishment. Lots of thread in this silk packet... deep denim blues, hunter greens, rich deep red, and the crisp creamy off-white. Bats in the Belfry - Tall and skinny, this measures 43 wide by 152 long... so approx 3 x 10! 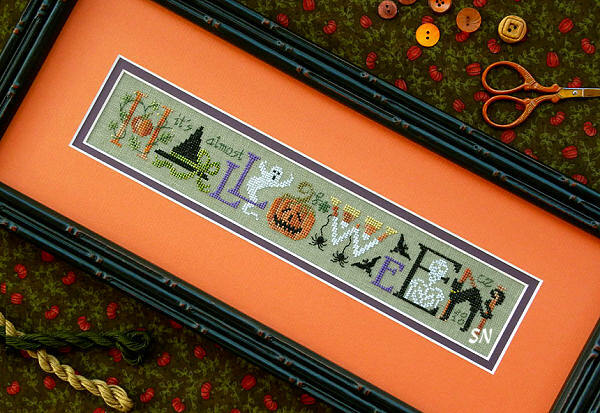 Just a bitty thing, it features the same delicious silk colors as the 'Pumpkin" chart, and this design also includes a bonus chart that IS that little Jack-o-Lantern down at the bottom of the piece. Love that big moon behind the tree! 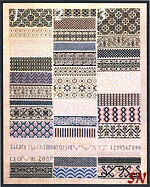 Cynthia Zittel has three new designs all presented in chart format with or without the necessary silk threads! Apple Blossoms Sampler is gorgeous! 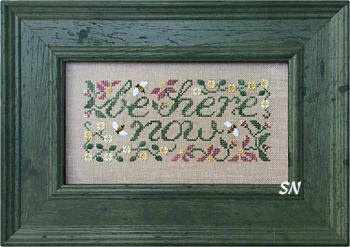 Worked on 32ct Tumbleweed (a dusty green linen) it measures JUST 2-1/2 x 12 inches in size. It's NOT large!!! The bird in the tree branches, what makes this dramatic are the apple blossoms and light colored alphabet letters. As always, Cynthia tosses a lot of special stitches into her designs -- for lots of texture and interest -- makes them more fun to stitch! 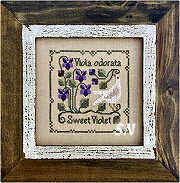 Sweet Violet & Common Lilac -- Well one of these got left behind in the 'cute name department!!!' A new set of small botanicals, these each finish only 54 stitches square -- 3-1/2 inches square on 30ct Antique Lambswool Linen. Hand-dyed silks... special stitches... these would make gorgeous pin cushions all nestled together in a neat old basket. Presented as charts with or without the silks. Charted for the 5 shades of silk, it'll be easy to convert to hand-dyed cottons - her pictures are really nice on the chart. There is also a small 'take-out' from this - a small bird - that would make a cute ornament or scissor fob! Very Nice! Two more designs in this cute series of greetings... these join Spring, Summer, Autumn and Winter... they are all really fun! Stitch JUST the motifs -- some of them can stand alone -- or add the word, each finishes approx 2 x 14 on 30ct Antique Lambswool Linen. 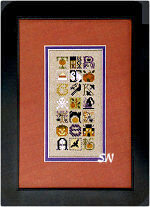 As with the others in this series, all are coded for Dinky Dyes and Needlepoint Inc Silks and feature a few small button or bead embellishments. For a limited time, our charts will include Cynthia's silk packs. After those sell out, hand-dyed flosses will be the way to go. 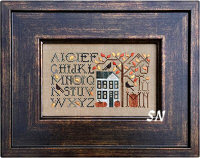 They are really cute stitched up - lots to look at and catch your eye. Cynthia likes special stitches - so there are a few of those scattered all over in these! If you don't have a horizontal space, think about positioning these vertically! Welcome Summer -- The final design in Cynthia's 4-Seasons Welcome series, this one features summer birds, a big bee hive and billowing flag. Same size and format as the companions, it is stitched on 32ct Antique Lambswool with pretty Dinky Dyes, Thread Gatherer and Needlepoint Inc Silks. For a limited time... we have those silks and embellishments kitted for you. DMC equivalents are always listed on the charts. Be Here Now -- A little reminder to stop and smell the roses!!! 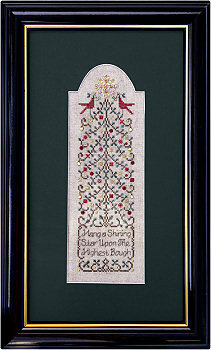 Stitched with silks on 32ct, it finishes approx 3 x 9. Lots of pretty specialty stitches in all those leaves! 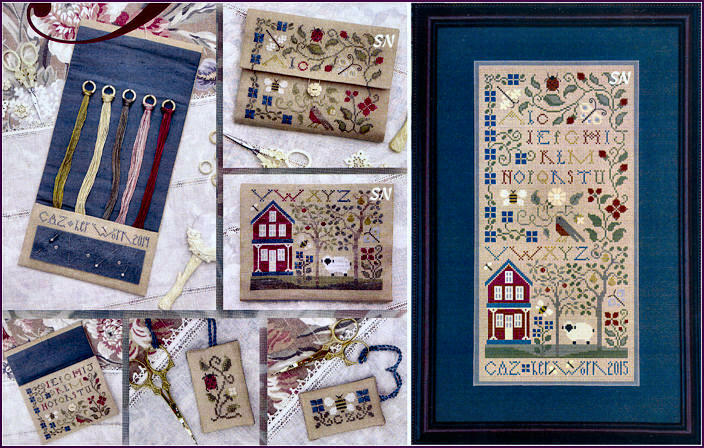 Cynthia Zittel has a pair of lovely spring designs on the way to us -- they are full of her stitching personality -- and are just delightful! Presented as the charts WITH her exclusive silk packets. The Garden Gate 'Those who enter through this gate come never too early no stay too late.' 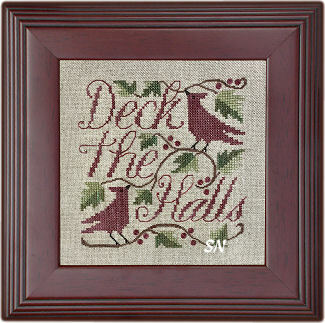 Stitched on 32ct Beachwalk Linen in silks, this finishes approx 12 x 3-1/2 inches in size. It is PACKED with all sorts of fun specialty stitch bits -- TEXTURE EVERYWHERE -- and just about as many little garden critters!!! 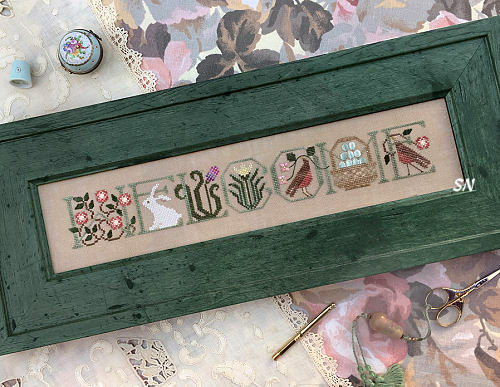 Birds, bees, squirrels and a kitty, the fence is pretty, the bird bath looks pretty popular, and the flowers are bursting with all those fun stitch details. Clear, large stitch diagrams -- nothing is too hard to execute. Every single motif is a bitty work of art just by itself... and you won't get bored stitching any of them! Welcome Spring -- We have a few of these now...Winter and Autumn... so this is the third in the set. 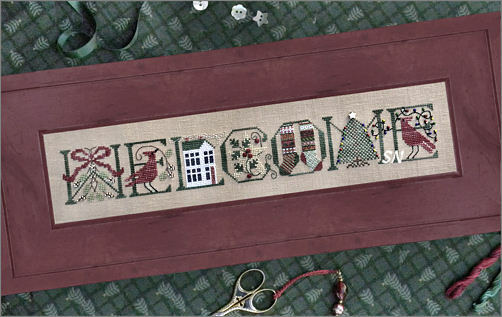 You can barely see the letters that spell WELCOME in here.. what you see are the charming motifs for the season -- all done with more of Cynthia's fun stitches. (she must lay awake at night making them all up... 'cause they are always different!) Several different silk companies featured for the threads, the stitch count on this is 216 x 30 -- so it finishes approx 14-1/2 x 2 on 30ct Antique Lambswool Linen. The Drawn Thread has 4 new releases -- models and patterns arrived today!!! 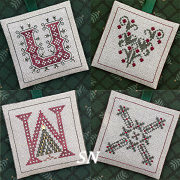 Christmas Thoughts is a cheerful spot motif sampler that hides the alphabet all over in between Wintery and Christmassy motifs. Stitched in reds, greens, golds and winter whites, every little letter is charming and surrounded by snowmen, candy canes, mittens, stars and all sorts of snowflakes and take-outs! The main sampler finishes 4 x 15 on 32ct Summer Khaki Belfast Linen. 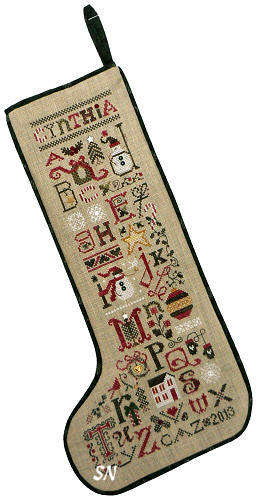 The stocking features a re-arranged version of the same design... so it finishes approx 6 x 14. Both have a smattering of petite glass bead embellishments, mother-of-pearl and brass stars, tiny micro-buttons, and green silk ribbon that ties around their package. 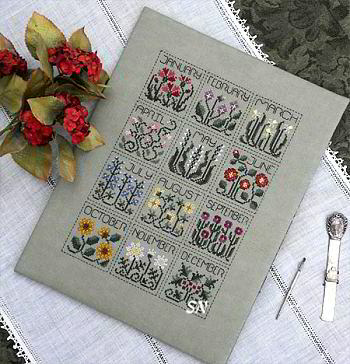 Very pretty, they are offered as the chart with the embellishments. Fabric and Gentle Art Sampler Threads offered separately. New Drawn Thread is Here! Cynthia has released fun, wintery designs!!! All are presented as charts WITH embellishments for now. 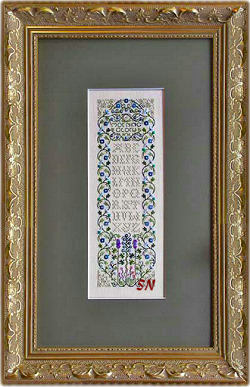 When our first shipment of charts WITH silks sells out, our remaining will be charts with embellishments. 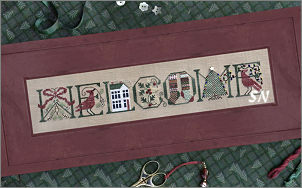 Welcome Winter -- Companions autumn, stitch this on anything neutral for that little snowman to POP! Finishing approx 13-1/2 x 2 on 32ct, it uses Needlepoint Inc and Dinky Dyes silk, is embellished with 4mm black buttons and has a few specialty stitches. Think about stitching some of the motifs without the letters if you want! Chart, silks and embellishments. 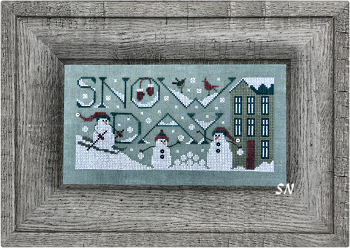 Snow Day -- A soft and dusty Stoney Point Blue linen is the background for all these snowmen playing in the falling snow. One of them is skiing... and there are birds skating inside the letter W! finishing aprox 9 x 4, it's the same size as Cynthia's seasonal ABC samplers, and it would make a cute standing brick-shaped block! 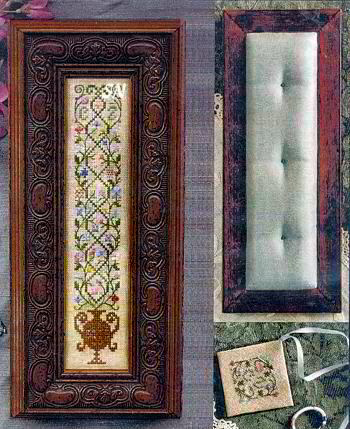 chart, silks, embellishments. 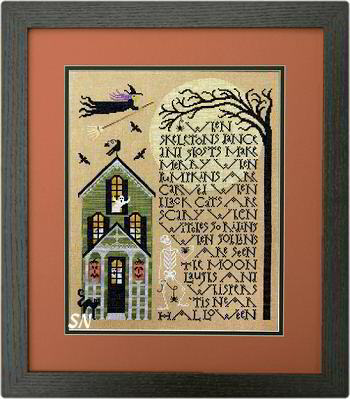 Stars -- On a dark 32ct, this uses Dinky Dyes, Needlepoint Inc and Thread Gatherer silks and is embellished with small tan buttons amidst all the special stitches. 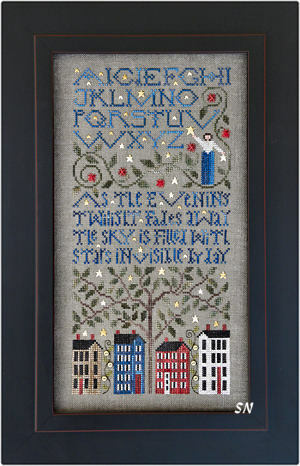 The verse is from a poem by Henry Wadsworth Longfellow, and the pattern inlcudes charts for stitching either as a sampler (with the last part of the verse at the bottom) or the entire verse. Pretty denims, brick reds, butter and cream colors... part of the design charm are all the tiny stars and then leaves evenly -- but randomly -- scattered everywhere! Chart, silks and embellishments. Cynthia has sent a couple of Christmas patterns that look like they'll be fairly quick to work up. 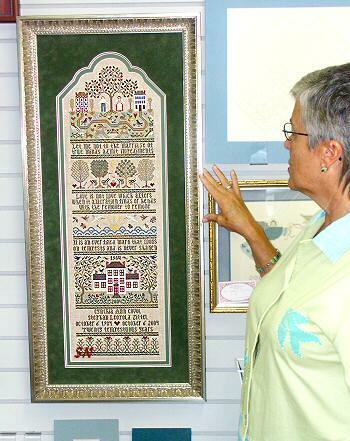 Presented in chart format, she uses Needlepoint Inc and Dinky Dyes Silks. Our first order always comes with the silk packs... when those run out, then we can offer the charts by themselves, but you are on your own for the threads. 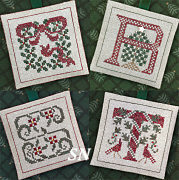 Christmas Baskets -- Here are 4 small 30 x 30 stitch count designs -- choose just about any fabric you like to work on for them -- they are all stitched with the same palette of red, green golden browns and cream. Cynthia has loaded them with special stitches -- even the chart GRAPHIC ARTWORK looks fun!!!! She's done all kinds of fun stitches on these, so each will look lovely by themselves, or stitched into the 4-patch. Presented as the chart with silks. Good Tidings -- This is delicious! It is worked on 32ct linen -- choose something dark so the snowflakes show up. Stitching is done with Dinky Dyes hand-dyed silks -- you can see the color variation on the letters -- that is all one shade of thread. The birds and lettering are all crosses but al the greenery is done as Ray Stitches -- lots of long stitches. Lots of drama! I think the stocking caps on the birds are kind of cute, too! Finishes approx 6 x 11. 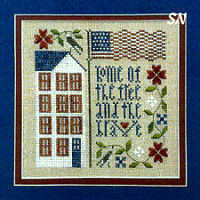 Presented as the chart with embellishments that are mother-of-pearl stars and bitty black glass seed beads. Autumn and Halloween *The Drawn Thread Way* are Here! 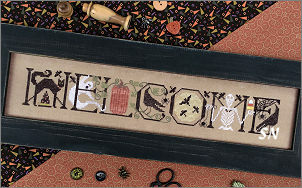 Welcome Autumn -- Cynthia Zittel of The Drawn Thread is beginning a new set of Seasonal Welcome Designs -- This is the first! 30 x 216 Stitch count (2 x 13-1/2! ), it is worked on 32ct Antique Lambswool linen and is coded for Dinky Dyes hand-dyed silk. FOR A LIMITED TIME, our charts are coming WITH that silk packet of threads. Very pretty with all it's textured specialty stitches, the colors are gorgeous! Make the individual letters into cushions and dump them all into a basket together, see how long it takes someone to figure out they spell WELCOME! Trick or Treat -- Skeletons, ghosts, crows and spiders... what could be better? Everything ELSE you want to see when you're out Trick or Treating!!! 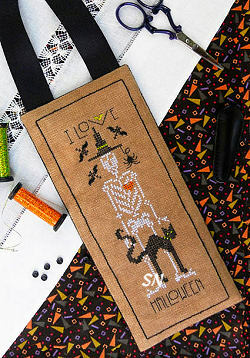 Drawn Thread's Halloween look is all over this charming row of pumpkins and birds. Special stitches everywhere, this stitch count is 50 x 210 and it is worked with Dinky dyes silks on 32ct Dirty Linen. Presented as a chart, there are three black button embellishments in it, and for a limited time, our charts will come with the packet of Dinky Dyes hand-dyed silks. So many cute motifs in here, another one to split up and make into a set of small cushions! 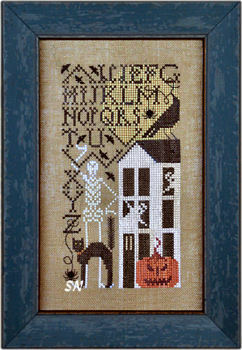 Simply Scary -- Another in Cynthia's Simple Sampler series... this is only 53 x 95 in stitch count, so quite petite! It is coded for either Dinky Dyes silks or Gentle Art Sampler Threads, and the chart includes a pair of bitty black buttons to make those little spiders! Very cute... I imagine this will be a 4-part piece -- just like her Simple Samplers for the 4 Seasons -- which have just finished! 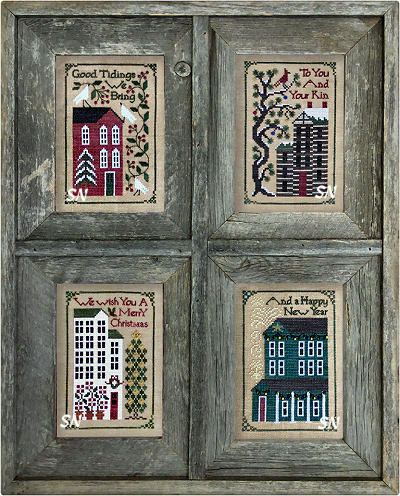 Spring, Autumn and Winter are being celebrated with these fun samplers by Drawn Thread. (No word about Summer yet...but I imagine it's coming in the next batch of releases later this Spring.) 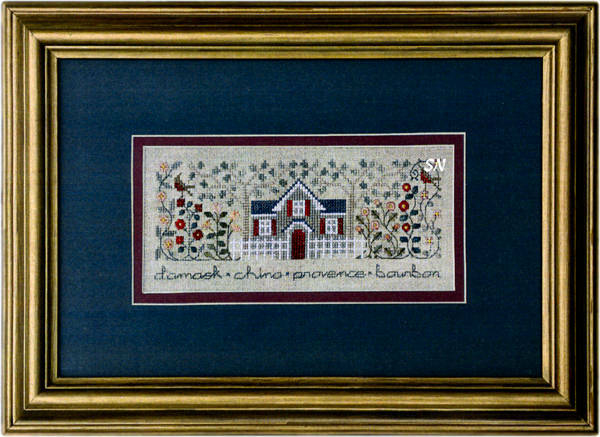 Petite things, each measures just 95 x 53 in stitch count -- 5 x 6 on 32ct Dirty Belfast Linen. All of them feature a neat house, the season spelled out in the side yard, and the alphabet in the other side yard. Cynthia shows all of these attached together as one digital image on the chart backs... along with SINGLES of JUST THE HOUSE and the season. If you're so inclined, dump all the alphabets!!!! Who needs all the extra stitching??? She has added a few special stitches to each one -- for texture. Autumn has lovely Satin stitched leaves, Winter has Smyrna Crossed snowflakes and Spring has both stitches in it's leaves and flowers. 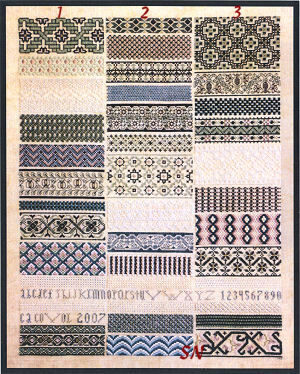 All of them are charted for Gentle Art Sampler Threads as well -- only 6 or 7 colors in each -- so threads are EASY to get and super pretty! Offered as charts. The final installment in this 4-Seasons Set -- Simply Summer -- mimics the rest in its series. 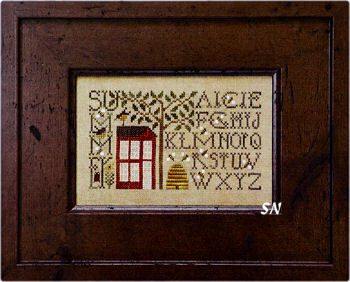 32ct Dirty Belfast, Gentle Art Sampler Threads, the hive and the teeny bees are all Stain Stitches! 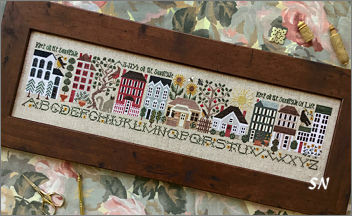 This is a fun little piece -- it finishes about 5 x 7 when stitched as charted -- but there are lots of elements you could stitch alone and make a coordinating set of cushions out of them! Charted for Dinky Dyes hand-dyed silks or Gentle Art Sampler Threads, we have the silks packaged for you NOW -- for ONLY a limited time. The honeycomb border is simple X's over 4... but the bees are Satin Stitches with Upright Crossed wings, and the flowers are Leviathans. You could stitch a little cushion of ONLY the honeycomb, then another of just the big bee, and more of the flowers and the baby bees! They would be charming nestled together in a small bowl. Pretty golds and greens with a tiny touch of dusty raspberry, silks are available only till our first shipment runs out. One is nearer God's heart in a garden than anywhere else on Earth. Another of Cynthia's signature lines of glorious blossoms... this luscious garden has everything growing in it!!!! All those pretty flowers are pictured in color right beside their stitch guides -- each of them is loaded with specialty stitches! The overall stitch count of this is 172 x 172 -- finishing approx 11-1/2 inches square on a 30ct. Each flower is labeled, then that honeycomb inner border, then that wonderful verse. The chart is coded for silks ONLY -- and for a limited time, we have them! The chart also calls for a couple of Mill Hill beads -- not included in the silks. 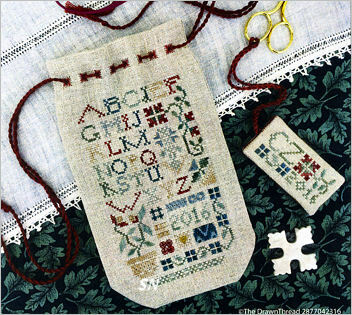 Here's a fun design -- a petite 52 x 90 stitch count spot motif sampler that is shown on the front of a 6 x 9-ish little linen sack! Cynthia has very detailed placement charts and finishing instructions in here... along with stitch diagrams of at least 19 different stitches. (I just love looking at all those -- they feel like puzzles when you follow all the numbers and your stitch actually turns out!) Tons of detail in here, you personalize the back of your linen bag, and then make the matching scissor tag. Coded for Dinky Dyes silks or Gentle Art Sampler Threads -- we have the silks available for a limited time -- NOW. 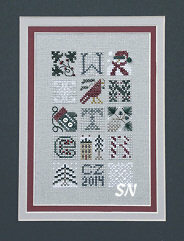 Cynthia has a new Simple Sampler -- just a bitty thing -- to stitch in a jiff for Christmas. Santa is standing there on the rooftop, he's got the Christmas tree -- but instead of reindeer, we have lovely white Satin-Stitched doves! 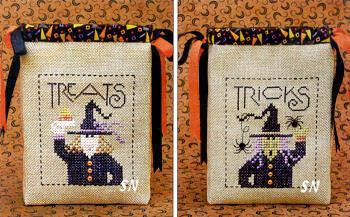 Worked on 32ct Dirty with Sampler Threads and DMC floss... it finishes approx 3 x 6.. Skip all the lettering and the roof, and Santa and his tree are not even 2 x 4!!!! They'd make a cute ornament or a fob (and 1 x 2 over one!!!!!!!) Presented as a chart with a single bitty black button embellishment. 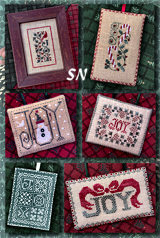 Six little ways to stitch JOY... pine cones, candy canes, birds and bows... each of these small designs is approx 3 or 4 inches in size on various 32ct fabrics. 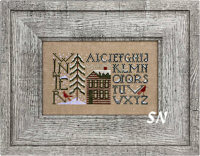 Sampler Threads or silks, the chart comes with a smattering of petite seed beads and a pair of teeny black buttons which are on the snowman. Nothing too involved, just a smattering of easy designs to whip up for some special stitched gifts. The Drawn Thread's 2015 Fall Releases are Here! Cynthia has been busy, and has sent REAL CUTE new things for Autumn and Halloween. 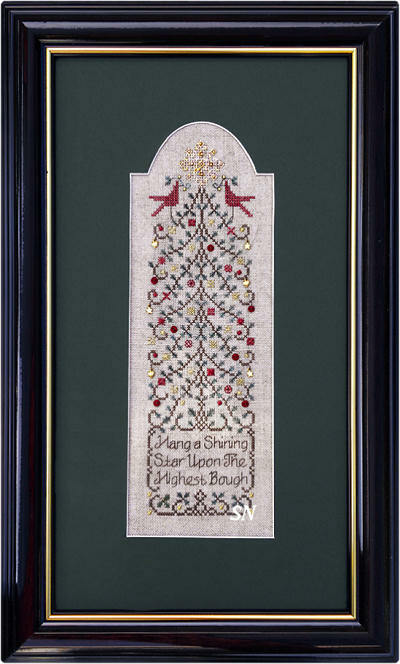 Everything is offered in chart format and for a short while, we have silk thread packs for most of it! Special stitches here and there -- nothing is too involved so you'll have fun stitching all of them. Do you remember seeing her working on these models while she was here for our Event this past summer?????? The Haunting -- This is really cool! 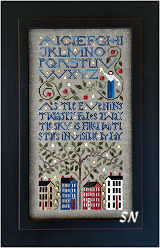 There is so much going on in here... it is worked on 32ct Cobblestone linen and measures about 9 x 18. Coded for Dinky Dyes Silks (this is what is featured in our thread packs) or Gentle Art Sampler Threads, this is full of color and really charming. 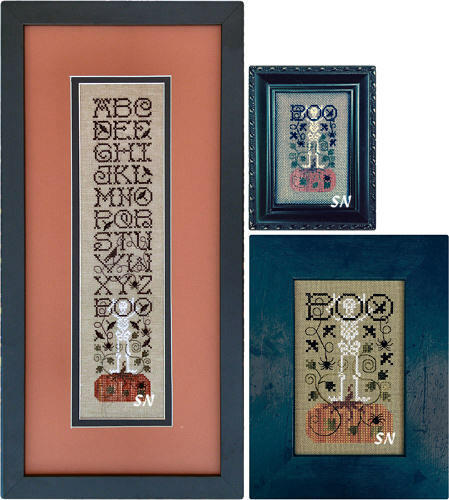 Nestled among the alphabet are motifs of everything Halloween -- and a lot of them are worked in Satin Stitches or Eyelets. She's got a *Bat Stitch* in here, which is a series of 9 straight stitches stacked so they look like bitty bats! The hand-dyed threads are gorgeous rusts, mossy greens, cream, a touch of antiqued honey and black. Offered as the chart, our silk pack is offered separately if you'd rather use silk than cotton. Tangled Up in Boo -- A skinny skeleton (I guess there isn't any other kind!) perched on a pumpkin, you have several different design options with this chart. Work it on 32ct Dirty Belfast linen -- that's the long sampler. 18ct Brown Mono Canvas delivers the framed piece, and there is a tiny black box (Amazon ordering info inside the chart) option worked on 28ct Touchstone linen. The silks we offer are Dinky Dyes for the long sampler - the other pieces call for Gentle Art cottons. Wow, Cynthia presents the Rose Garden of Ricardo -- her neighbor across the street!!!!! A incredible rose garden full of special stitches, Cynthia's garden doesn't need as much daily care to look lovely year after year! Worked on 32ct Natural Linen with Dinky Dyes hand-dyed silks and Needlepoint Inc solid silks, the colors are mossy greens, dusty roses and some tarnished golds. 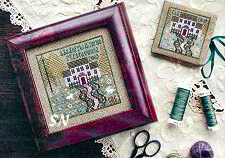 The charming cottage is surrounded with roses and climbing vines all STUFFED with glorious, intricate special stitches that are just fascinating to pour over in the instructions. She doesn't even have names on the roses -- each vine has a different 'variety!' and each has their own leaf-stitch! Ricardo's Roses has a stitch count of 111 x 44, so it will finish a petite 2-3/4 x 7 inches!!! Just a beautiful little piece! 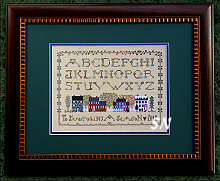 Offered as the chart, we have the silks (just enough to stitch this) bundled together -- FOR A LIMITED time. 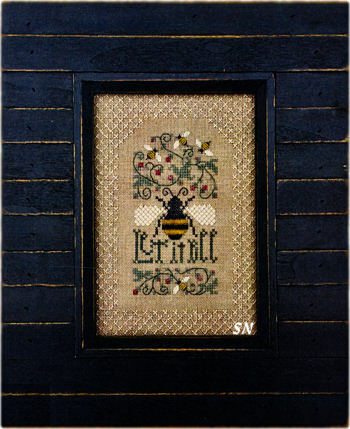 Oh, this is a pretty piece -- only 76 x 76 stitches in size! Stitched on 32ct Summer Khaki Belfast Linen, it'll finish a petite 5 x 5 in size. 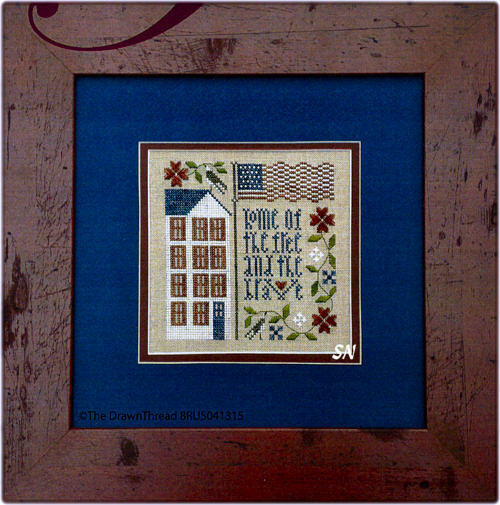 Coded for Gentle Art Sampler Threads of Old Red Paint, Freedom, Wood Trail and Endive, with a bit of white DMC tossed in, everything in the house, flag and verse is a Cross Stitch. Everything else -- the flowers, leaves and vine are special stitches. The largest flower goes over 11 stitches -- 22 threads!!!!!! So very pretty, this is offered as the chart. 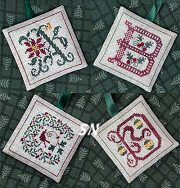 It depends on your mood -- sampler or sewing pocket!! There are fob charts in here... and several different charted options for all the design possibilities... along with LOTS of finishing and assembly instructions. (18 printed sides of paper!!!) And then... we get to the charming design itself! The summer house nestled beside all the fruit trees, then you begin to notice all the bees and ladybugs, dragonflies and blossoms. THEN some all the special stitches that make them all *pop! * I think Cynthia makes up all these stitch names, because they are so lovely and dramatic. 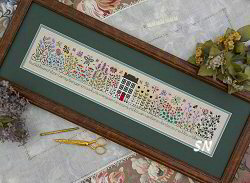 We go from single Cross Stitches to her largest sampler flower which involves 23 threads!!! Stitched on 32ct Amber Linen, the Pocket finishes approx 6 x 17 -- so folded it'll be 6 x 5-ish. The fob is a bit under 2 x 3. 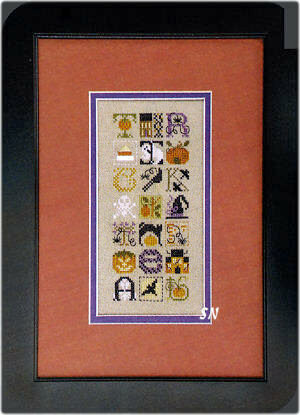 The larger sampler finishes about 6 x 12-1/2. Worked with Dinky dyes hand-dyed silk and a little Gentle Art Simply Wool for the little sheep, the colors are rich berry-brick, denim blue, olive greens a bit of butterscotch and icy creams. FOR A LIMITED time we have the silks packaged (just enough for the sampler OR pocket/fob) together. The Pastoral is coded for either the silks or Gentle Art Sampler Threads, and is offered as the chart. No extra silk packs... so if you do the sampler in silks, choose the flosses for the pocket -- or the other way around! The Drawn Thread's Cynthia Zittel has some new tool cases for *Stitcher's Power Tools!!! * Worked on 32ct Summer Khaki Linen your pair of cases is stitched with either Dinky Dyes and Needlepoint Inc silks or hand-dyed and DMC flosses. The Needle Pocket features gorgeous specialty all over the front with a pocket inside to store needle packages as well as a stitched 'ruler' to identify loose needle sizes! Really clever! 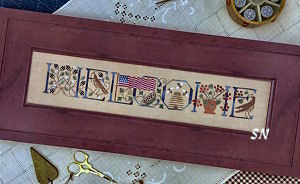 The scissor case is kind of a tri-fold style with stitching decorating all the front and back panels. 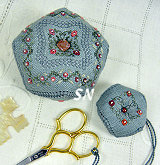 A petite set -- the needle pocket measures approx 3 x 9 -- like a checkbook, while the scissor envelope is about 3 x 4. Special stitches everywhere... you'll love making these! Offered as the chart. 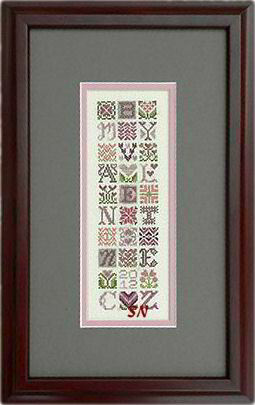 This is a charming alphabet stitched on 32ct Antique Ivory Linen using 1 ply of hand-dyed silks -- all pretty roses, raisins and greens. 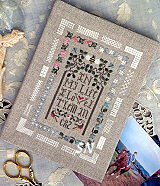 Finishing approx 3 x 10 -- it's just a petite thing that is FULL of fun, special stitches for texture and intrigue! This may be the alphabet -- but it is NOT boring!!! A wisp of a thing -- this finishes approx 1 x 6 on 32ct! ONLY ONE by SIX! 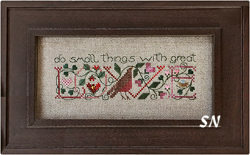 A sweet little piece full of birds and a message of love... this is worked with silks or cottons. Colors are soft roses, fabric could be anything you like. There are five special stitches in here -- but very basic in nature -- so they won't slow you down. Offered as a chart with a shiny gold heart charm. Cynthia Zittel has a pretty new Christmas Tree design -- the lacy green boughs are loaded with red berries and birds, along with glistening petite gold seed beads and lots of gold metallic threads. 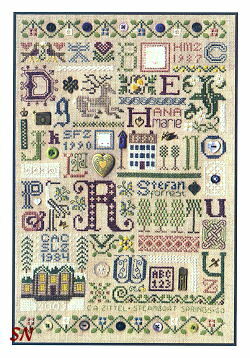 The stitch count is 43 x 148 -- it finishes approx 3 x 10 on 32ct Natural Belfast -- and specializes in a light, lacy Christmassy personality. Our first offering of charts includes the silks, metallics and beads. After our initial shipment sells out... no more accessory/thread packs will be available. Got all that??? 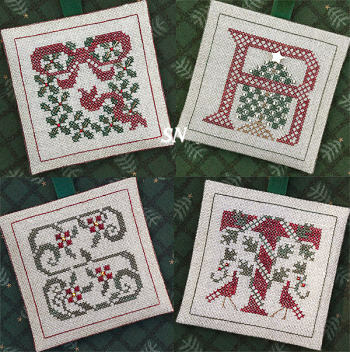 Drawn Thread has finished her alphabet set of ornaments. 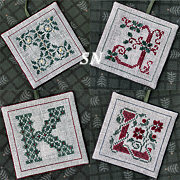 Each letter has been stylized with stitches and beads or charms... all finishing around 3 x 3. 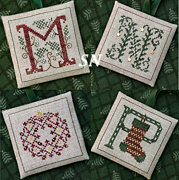 Make them into individual blocks, cubes or words... or make the complete Christmas Sampler. You could even make money pockets with everyone's initials on them... not tell anyone what's in them till Christmas morning, and then make them find their pocket on the tree! (What if Santa left a new pair of scissors in yours???) Or, each Christmas, tuck their school picture in there... and in no time at all... you'll be able to remember your child growing up all over again -- every year when you trim the tree! The Scissor Tag pics are confusing. One side is next to that cushion -- attached to the black 4-inch scissors in that same photo. The other side of the *same fob* is pictured in the lower right-hand picture. (it looks the same size as the cushion -- but it is much smaller in real life.) So... in trying to UNCONFUSE myself... you get three charts in here. 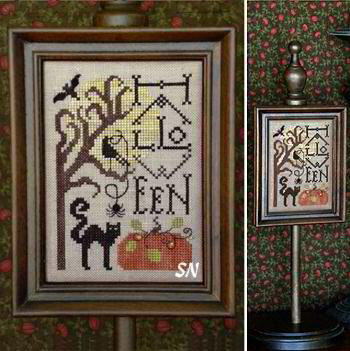 The framed sampler (which can be worked into a cushion) along with a two-sided fob! Finished size depends on your fabric choice... our silk pack will work on the 28ct. Another multi-piece project... this one offers a 91 x 35 stitch count framed piece (18ct fabric suggested) that can be finished into a 91 x 35 stitch count sewing pocket (32ct fabric suggested), with a smaller 25 x 63 stitch count fob design. (same fabric as sewing pocket uses). Pretty silks and Valdani flosses are included in this optional thread pack, and there are lots of finishing instructions in here for that case. I love how that skeleton is holding his candy corn in one hand and a spider in the other!!! Fabric options galore with this one! Offered as the chart with silks separately. The Autumn Sky's full moon is the backdrop for all this tomfoolery! Ravens and bats against that moon, that super-creepy FAT little spider dangling there - his body is a small black button, that in real life makes a HUGE spider!!! The pumpkin vines are everywhere, and that untrustworthy crow is just waiting for a meal!!! Stitched on 32ct Dirty Belfast Linen in Dinky Dyes and Needlepoint silks (in the optional thread packet) or Gentle Arts and DMCs... this fits onto a Sudberry House Shaker Pin Cushion Base or one of the round resin boxes that Shepherd's Bush uses so much. The matching smaller design is a mere 34 x 34 stitches in size... it teases your eye.. because it matches the bigger piece so well! Both charts are offered in this packet... Buttons and silks offered separately. 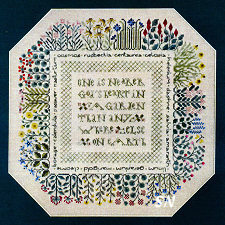 Cynthia's 6th Garden Scene Sampler -- we now have all four seasons as well has the Herb and Butterfly Gardens. Always the charming house in the center... she surrounds it with a LAVISH blooming garden of all the things quintessential to its season! With a stitch count of 289 x 63, this finishes (like the rest) at approx 4 x 18, and is worked on 32ct Summer Khaki Linen. It is coded for Needlepoint Inc and Dinky Dyes silks... and **for a limited time**, we have the thread packs available as well! 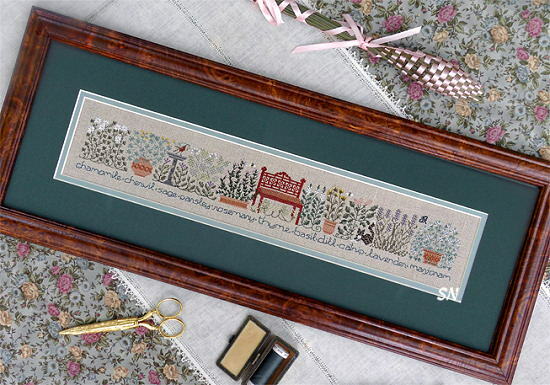 (sorry, no open-stock thread packs) We LOVE, LOVE these gardens, because Cynthia loads them full of special stitches that look neat even on the CHART, not to mention stitched in person! Oh my gosh, this is a charming piece! 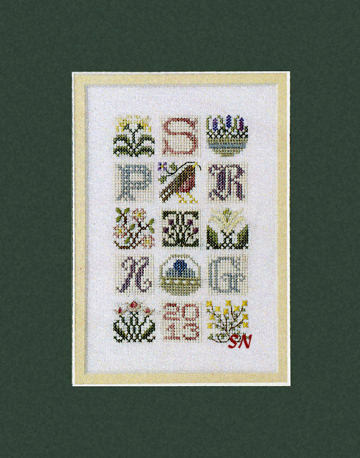 A long, skinny alphabet -- that is stuffed full of garden treasures and a ton of birds. Cats, squirrels, mice, birds, birdhouses and birdbaths, and LOTS of silks and special stitches... this measures 54 x 336 stitches in size. Worked on 32ct Summer Khaki Belfast Linen -- it'll turn out approx 3 x 21. Of special note to the industry -- Cynthia has special watermarked paper in this pattern. If it is copied illegally... the chart has eyes in the back of its head and will tattle!!!!! 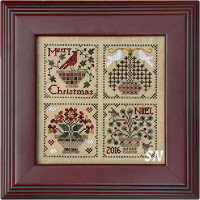 Another one of these cute miniature block designs that spells out the season or holiday... Cynthia has finished ALL FOUR SEASONS and shown the medley design on the back cover of this chart. 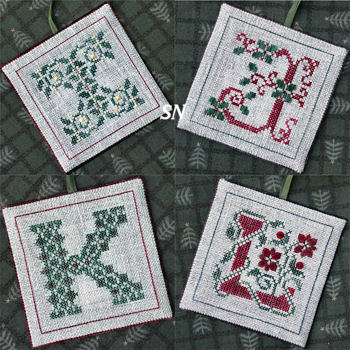 These are great 15 x 15 stitch count squares full of seasonal motifs and cool letters -- and special stitches to boot! Make them into fobs or ornaments, OR make loonnnnng and skiinnnny samplers out of them! 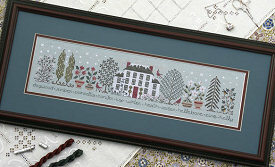 The Drawn Thread has sent three new designs this week... Winter Garden is just one. It is her 5th in a garden set -- joining Spring, Autumn, Butterfly and Herb Gardens. 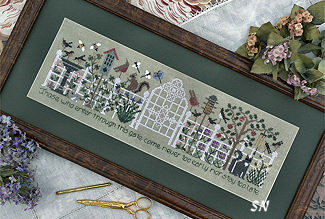 Same size and general flavor as the others, this 289 x 63 stitch count design features the Grand Manor along with it's lavish garden of Wintertime Growth! Pines, holly, dogwoods, juniper, ivy... everything is growing so beautifully in the Winter Garden! Cynthia loads these with special stitches so everything takes on a bit of texture and interest... and this piece is coded for 9 Needlepoint and 5 Dinky Dyes hand-dyed silks. Wintery reds and greens, and of course the white snow all pop against the 32ct Smokey Pearl Linen background. Offered as a chart. Oh, another of these fun mini-motif designs that spells out a word. Cynthia has quite a few of these for the different seasons and holidays -- all of them are farther down this page. We LIKE these because you can do a lot of different things with them. 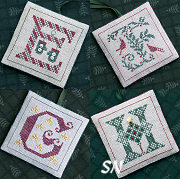 Stitch the pic as shown... make individual fobs or ornaments... finish them into little building blocks. By now, you have a million different assorted letters and designs -- do something fun with them! 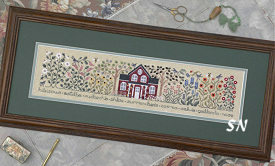 I see this one stitched as one long tube -- finished into a hot-dog shape to grace a breezy windowsill! Lots of fun stitches, each tiny square is only 15 x 15 stitches -- NOTHING AT ALL to do! Coded for 6 Needlepoint and 3 Dinky Dyes hand-dyed silks, once again, we have a LIMITED number of silk and small embellishments packets available for this. Offered as the chart, a gray color fabtric is suggested so that the snowflakes pop! Oh, I love this series of designs! 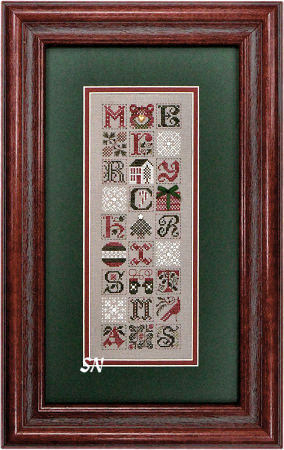 MERRY CHRISTMAS is spelled out in one-inch-sized letters -- each in it's own little square -- but every other square in the design features a tiny seasonal motif. 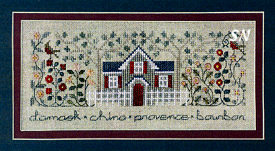 A mere 55 x 169 stitch count -- this measures 4 x 14-ish on 32ct Natural Belfast. 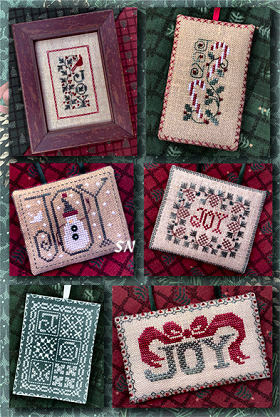 I have pics of some small cube ornaments - they are some of the squares stitched together to make small ornaments!!!!!!! 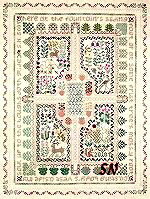 Can you see that from the sampler motifs??? 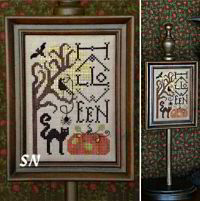 There are so many things you can do with all these small motifs, those are a great wxample. Anyway, the main sampler is garnished with a smattering of petite seed beads, and again, that length of green silk ribbon to tie the package in the 4th row. Lots of fun, this is offered as the chart with embellishments. The Autumn Garden - A companion to Herb, Butterfly and Spring Gardens, this time we have the autumnal garden and all it's specific plantings . Chrysanthemums, sedum, pumpkins and squash... sunflowers, and lots of crows, this garden is full of all the things that blossom in the fall. Stitched on 32ct Dirty Belfast Linen, the silk colors are STUNNING! 10 different Needlepoint Inc Silks, and 6 different Silk 'n Colors, Waterlilies and Dinky Dyes, the finished size is close to the others -- approx 4 x 18. I just love all the special stitches Cynthia puts into these... all hidden in the flower detail, you never get tired of these! Offered as the chart with optional silk pack. Another of these fun sets of mini-blocks!! 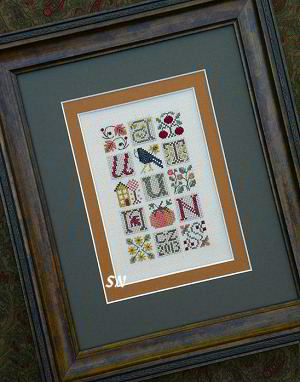 Joining several of DT's other seasonal mini-blocks (Halloween, Valentine and Easter all come to mind right away) AUTUMN is spelled out in one-inch squares -- surrounded by other 1-inch blocks of tiny motifs. 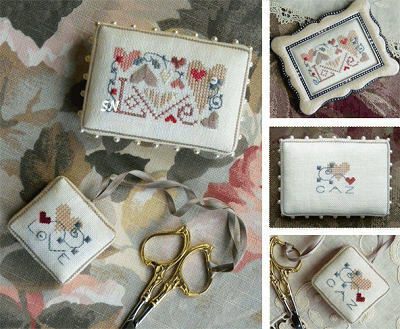 Again -- loaded with fun specialty stitches -- these are SO COOL stitched individually and made into miniature fabric blocks! They make stunning mini-ornaments and are perfect for nametags and scissor fobs. And... of course... lovely stitched just as Cynthia presents it! (I like these long and skinny too -- they look neat hanging above a door, and very unexpected trailing down a very skinny wall.) Stitched on any creamy linen the silks called for are rich taupes, olives, rusts and marigold. Only 49 x 83 stitches -- this is actually approx 3 x 5 -- just a bitty thing! Offered as the chart with optional silk pack! When skeletons dance and ghosts make merry. When pumpkins are carved and black cats are scary. When witches to riding, when goblins are seen. The moon laughs and wispers 'tis near Halloween! (Punctuation in verses always stumps me!) This is a neat piece! That busy haunted house on the left -- it's a picture all on its own. Then, that funky font for the verse -- all tucked underneath that craggy tree -- that side of the design can stand alone as well! It has the moon and dancing skeleton in the background stitched in a pale hand-dyed white-ish color -- so make sure your fabric is dark enough to show it off. (even choose some mangy hand-dyed from your stash?) Put the two halves together to make the whole piece -- it finishes approx 10-1/2 x 13 on 32ct Dirty Belfast Linen. Calling for Threadworx hand-dyeds... raid your stash for fun colors you might already have in the other brands! Offered as the chart. Here's a fun design that is shown in one of Sudberry House's small candle screens! A bitty 49 x 72 stitches on 32ct Summer Khaki Belfast Linen, 'Halloween' is worked with 5 shades of hand-dyed Dinky Dyes silk. It's small enough that you probably could come up with great colors on your own from what you already have on hand. 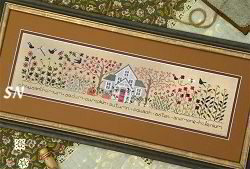 It lifts your needlework off the table... and no walls required!!! We LOVE those little 3 x 5 frames-on-a-stick! OH... 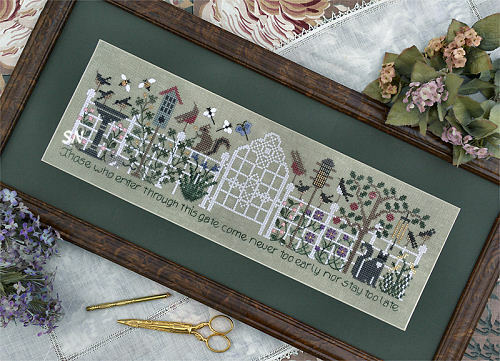 Drawn Thread has another long, skinny garden scene -- this one is LUSCIOUS! I have 4 dogs at my house right now... so my Spring Garden doesn't look like this! 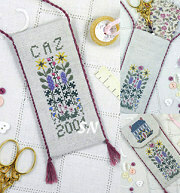 Following the same idea as her Herb and Butterfly Garden pieces... this is a row of pretty flowers -- all stitched with scattered specialty stitches everywhere! The chart is just one of those that your fingers itch to stitch!!! Finishing approx 4 x 18 on 32ct, this time around WE HAVE ALL THE HAND-DYED SILKS RIGHT IN THE PACKAGE! Yeah!!! Yummy Dinky Dyes, Needlepoint Inc and Silk 'n Colors, so many pretty colors to make all the lacy, delicate flowers. 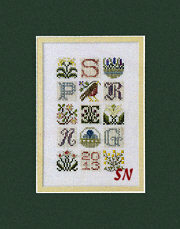 15 Small squares of Crosses and specialty stitches, spell the word SPRING... or just do all the other little boxes! I love the 15 x 15-stitch designs, they are stunning stitched as individual pieces and all finished into bitty cushions to gather in a basket. 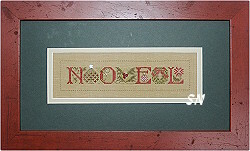 Worked in Dinky Dyes, Needlepoint Inc and Silk 'n Colors Silks, this is a very quick stitch! Every block is full of stitched texture, and there are a few tiny petite glass bead embellishments dotted here and there. 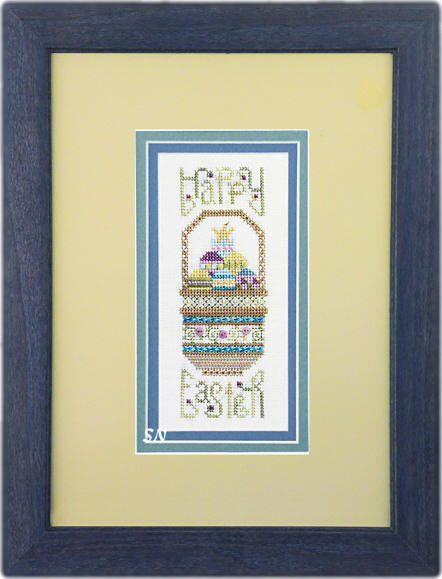 Since the entire alphabet is included, you can spell names in little squares... you could stitch a 4-square of one initial and three eggs... you could stitch all 14 eggs in a long skinny row... you could make fobs or needlecases... but I LOVE the idea of a basket of paper Easter Grass cushioning your linen eggs! Even choose several different pastel linen colors......possibilities are endless. Offered as the chart. 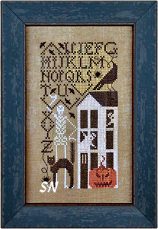 Here is a little band sampler that has lots of stitch detail packed into it's bitty 30 x 84 stitch count! Just fun, it won't take long to work up. Coded for Needlepoint Silks -- again another really good piece to harvest colors from your stash for stitching, instead of investing in more threads! You don't need much of anything -- just some baskety browns and pretty pastels for your eggs! Offered as the chart -- as usual Cynthia's great stitch diagrams are included. 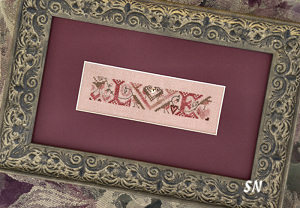 Drawn Thread's Cynthia has sent us two new designs... one very small... and this one... a sampling of hearts worked in AWESOME textured specialty stitches! A teeny thing to begin with at only 89 x 89 in stitch count, there is a simple border of Sprats Head Hearts surrounding 9 blocks of 20 x 20 hearts! 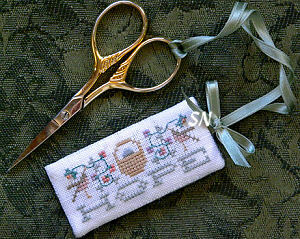 (perfect scissor fob or small ornament sized!) 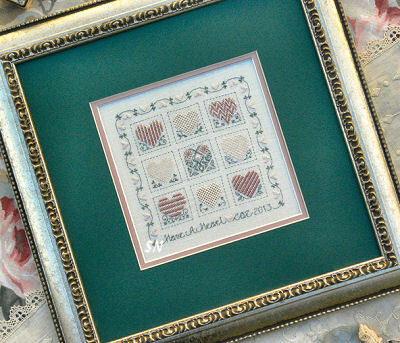 Each of the nine hearts is stitched using the coolest pulled, couched and woven stitches -- Double Twill, Double Ridge, Pulled Double Satin, Florentine... each one is a little miniature showcase of your stitching talents! Worked on any count of cream linen in only three shades of color -- cream, pale rose and pale green... if you choose 32ct -- this'll finish only 6 x 6! Offered as the chart... check into your stash for fabric and threads, or let us send you somethikng pretty! Just a wisp of a chart... LOVE... surrounded by lots of specialty stitches, this is actually a chart for a tiny 2 x 3 x 1 *mattress* for your pins, along with a matching scissor fob. Cynthia always chooses cool stitches to bring texture to her designs, and this is no exception. The main stitch count is only 20 x 40! Offered as the chart with complete finishing instructions -- choose fabric and threads from your stash! 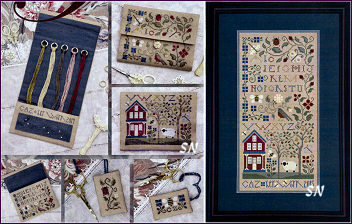 Drawn Thread's Cynthia has sent us 6 new designs this week -- along with all her stitched models! So... we are hosting a lovely Drawn Thread Trunk Show for a few weeks -- a last minute surprise!!! Give Thanks is an elegant tribute to your abundant Thanksgiving Dinner Table... only instead of turkey and dressing... you have urns, vases, and baskets of luscious berries and vines. Stitched on 32ct Vintage Country Mocha Belfast linen in soft taupes, cranberry reds, golden browns and mossy greens, (coded for Needlepoint Inc silks) Cynthia uses tons of specialty stitches in the chairs, vases and flowers... some neat ones like Lazy Daisy Crosses, Triple Rices over 6, Horizontal Smyrnas, Boucle Flowers, Double Broad Diagonal, Double Crossed Cushion... they all look like fun to execute. Finishing approx 4 x 18, this is offered as a chart. 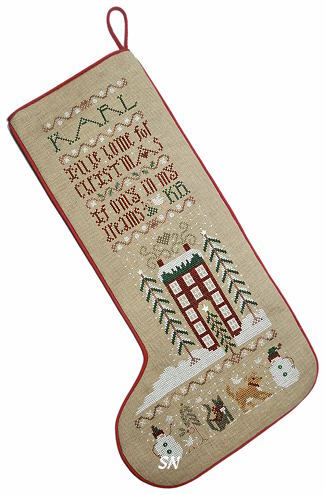 *I'll be home for Christmas if only in my dreams* A charming Stocking design for someone special in the family, we like the verse, the house and snow-covered trees, the snow blowing all around in the sky, and especially the snowmen and pets playing near the bottom. A quiet and traditional design, it is stitched on 28ct Dirty Linen and features a smattering of petite gold seed beads, a few star buttons and charms, and tiny green buttons to adorn the snowmen. More fun stitches all throughout the design! 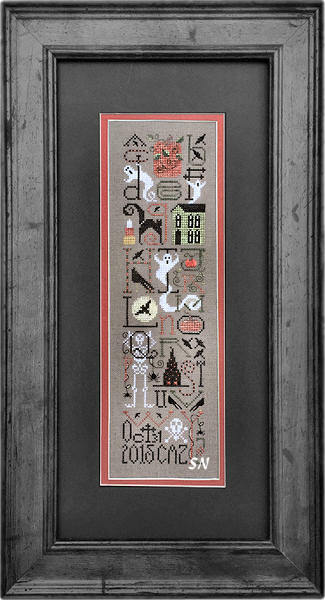 There is a matching band sampler to this -- maybe you don't want a stocking and have some wall space??? Click to the inside DT pages to see it. Little Noel A petite piece with a stitch count of only 28 x 124... this'll measure 2 x 9 on 28ct. 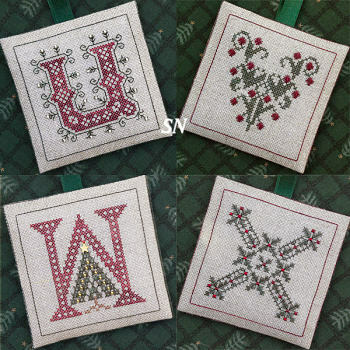 Four letters with three motifs between them, this features Diagonal Cross (between the N and O), star and berry buttons, and a few tiny seed beads. Nothing hard, but charmingly detailed! 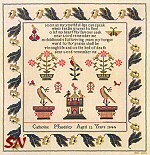 Offered as the chart with embellishments, there is an entire page devoted to finishing instructions to make this into a fabric hanging banner. 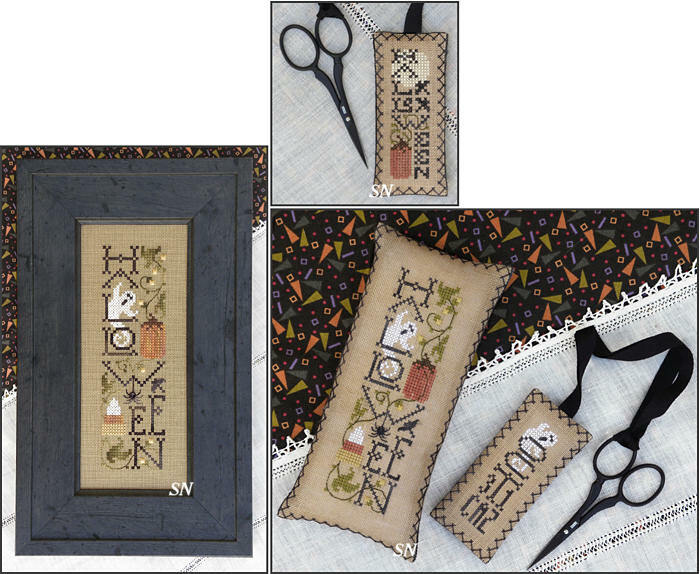 Drawn Thread has a new piece -- a companion design to Be My Valentine -- it's a series of MINIATURE blocks that include bitty Halloween motifs and letters to spell out 'Trick or Treat.' Really a very tiny thing -- 2-1/2 x 6-1/2 -- Cynthia has used a few Satin Stitches and a smattering of glass beads to embellish her squares a bit -- but each square measures ONLY AN INCH on 28/14 count and even smaller on the recommended 32ct Dirty Belfast. 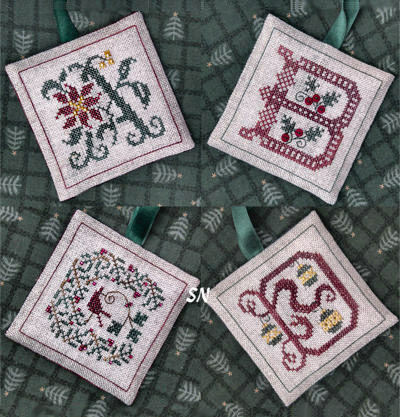 So cute, you can make some initial scissor fobs if your name has the right letters... you can stitch a set of small ornaments for a little tree branch... you could stitch these all in one horizontal row (1 x 21!) 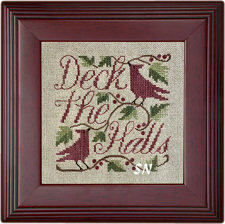 and hang it above a doorway... or you could stitch them all vertically (again 1 x 21!) and hang it on a skinny wall somewhere. You could even finish them into individual cubes to make a set of alphabet blocks! Offered as a chart. As you can tell from the pic -- rich rusty oranges, fun greens and purples and lots of black! 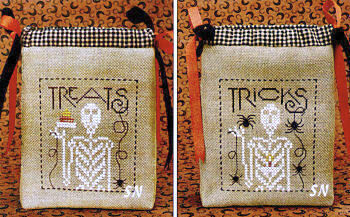 Here's a fun set of 8 x 8-ish treat bags that feature your stitching on both sides. Offered as two separate charts -- the skeletons are one, the witch is the other. The simple designs are stitched on 18ct Natural linen and measure approx 4 x 4 each. Cynthia has the charts placed on one piece of fabric, so as you construct your little bag the fabric is folded across the bottom. 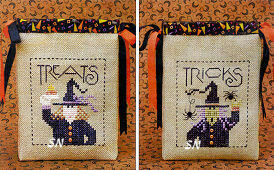 Cute designs, both are stitched in DMC with bits of hand-dyed floss from your stash. Our charts include the black or orange mini-buttons featured in the bats and witch dress. 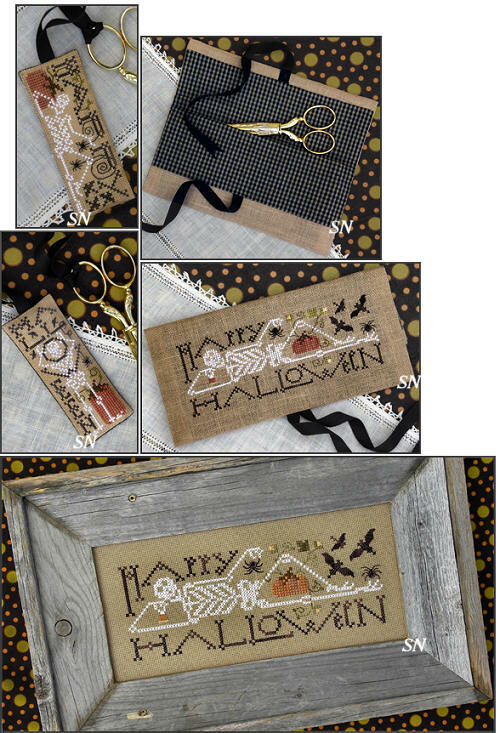 Super quick to stitch... what a fun way to use cute Halloween fabrics for finishing along with flourishes of cool ribbons! They would also be cute as hard-sided buckets -- either way -- cute centerpieces to hold that precious Halloween candy! Look at what has arrived!!! Cynthia Z has outdone herself with this new collection! First is The Herb Garden -- a sequel to her Butterfly Garden, which is enchanting. This one is just as full of tiny specialty stitches in all the flowers as the first, and will measure the same 3 x 19-ish size. Next is In My Life -- a photo album or brag book cover. 'In my life I loved them all.' 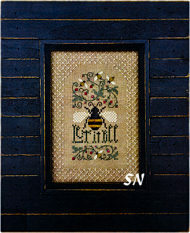 Neat border of tone-on-tone specialty stitches surround the interior floral bee garden and the verse. All are in chart format... and promise to make your stitching stash SO HAPPY! A fun sampling of 30 -- 13 x 13 mini-blocks of stitching. 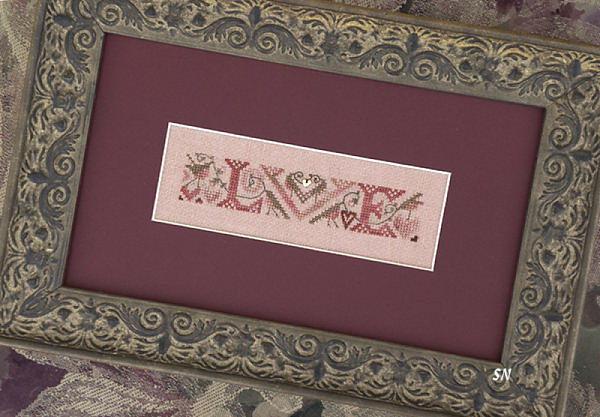 While the message hidden in here says 'B My Valentine,' each of the little 1-inch squares is full of specialty stitches all in a small selection of olive and mauve threads. Just a tiny thing... this finishes approx 2-3/4 x 9 on 32ct!!! It looks so much bigger than that to me... but the squares really ARE miniatures! Wouldn't this be fun stitched and finished into teeny individual fobs or flat ornaments and either stashed into a pretty basket all mixed up, or hung on a white Valentine Tree Branch??? It'd make a really cool seasonal decoration, that someone would have to play with and study a bit to read! Offered as a chart, coded for silks -- there are few enough colors that you could convert to flosses from your stash, too. Sometimes, something like this is eye-catching stitched all in one long row -- you could hang it over a doorway horizontally, or on one of your skinny walls vertically! 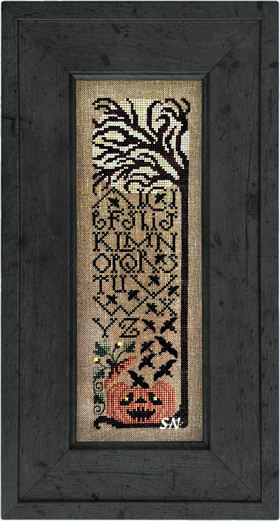 Offered as a chart and coded for either DMC or silk... this is full of Drawn Thread Personality! Oh gosh... this is just stunning! I can't wait for our shop model to be stitched of this one! An incredibly busy medley of wildflowers all growing happily in the garden... everyone has his own butterfly fluttering about... and I can even see tiny bees dotting the skies. With a stitch count of 355 x 59, this finishes approx 3-1/2 x 22 on 32ct... choose a light pastel color of green, yellow or blue... so many pretty fabrics would work for this one. As you can imagine, there are tons of special stitches in here, so this one will be totally fun to stitch. Offered as the chart, it is coded for silks or DMC... there are a few hand-dyed in here... so it's another one that delight in that stash of your colors!!! Drawn Thread has a new pattern that is a medley of wildflowers and the days of the week. Designed to be the cover of a date or address book, the front design's stitch count is roughly 110 x 150. The pattern does call for a specific date book style, so we advise getting the chart first... then getting your date book... THEN figuring out what size of fabric you'll need to use! 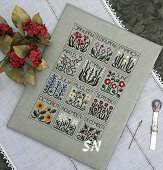 Lovely stitches scattered throughout, Cynthia does use Needlepoint Inc and Dinky Dyes silks, and includes a complete placement and finishing guide to stitch this in the proper place on your linen, that is being made into the entire datebook cover. If you don't want to go the datebook route, this would make a DARLING mail-holder or you could tuck it into the clear front of a binder or folder to hold that week's shopping lists and coupons! I could, of course, stitch this to put in front of the Silver Needle employee time-sheet book... ! A Holiday Hanger finishing 3 x 7-ish on 28ct Dirty Linen, this is simply finished by mounting needlework over a slightly 'puffed' board. 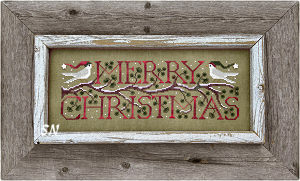 Super easy -- you can add some pretty trims to the edges and some festive ribbon, too, for lavish hanging treatment. 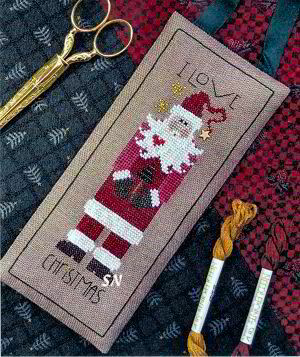 Mr Santa is stitched in DMCs or silks -- your choice -- with touches of metallics, but his beard is worked in Rainbow Gallery's Wisper regardless of other threads used. Check your stash of embellishments for something to add to his hat, tree? sky?... just anywhere! Offered as a chart. Oh my Gosh... there are 43 DIFFERENT stitches in this! That's probably why its named ***Bouquet of Stitches***! Stitched on 36ct Cream Edinburgh Linen, each flower is it's own unique little stitch! 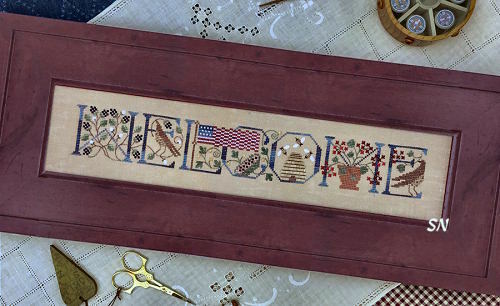 Mount it into the top of Olde Colonial's Embossed (or Plain) Pencil Box... and you have a floral masterpiece that was so much fun to stitch. Design in chart format is approx 2-1/2 x 8... the pencil box is offered separately. Directions to make the silk 'mattress' lining the interior are included, as well as the chart for the matching little fob. VERY pretty! This is a captivating piece -- petite at 60 x 60 stitches -- and packed with something like 25 tiny specialty stitches. 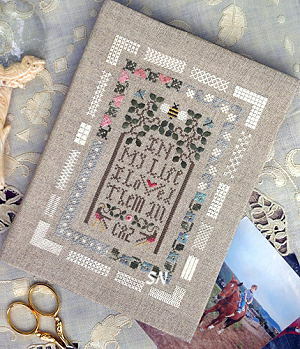 The matching needlebook is even a tinier version of the 'big' piece! Texture and fun detail everywhere... you'll want to showcase this piece on the top of Olde Colonial's Small Dowry Box, or frame it and display on a table-top easel. You want everyone to be able to see all the stitch detail easily. 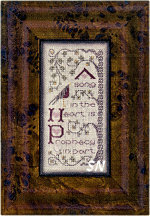 Offered as a chart, coded for silks, it looks like FUN to stitch, because all is packed into such a tiny area. 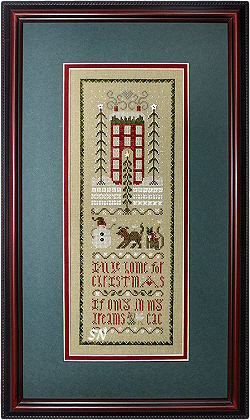 Drawn Thread has 5 new releases... this skinny skeleton and the lavish Christmas wreath are the two *quick stitches. 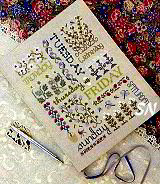 * October, November and December's Calendar designs are shown below. This scant skeleton is worked in plain white, but features metallic green and orange highlights. Finish him any number of ways, on just about any fabric you want, he's just cute and simple. The wreath piece is actually quite large -- finishing approx 13 x 13 on 32ct... it has a verse surrounding a lovely flowing vine wreath of holly leaves and little birds hidden everywhere inside the vines! 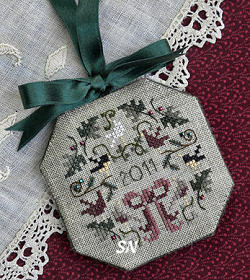 There is a smaller bonus ornament design included as well -- equally as charming with the hidden birds. Both are offered as charts. LOVE features pinks and purples. IMAGINE uses one single taupe/ecru hand-dyed for everything. HOPE calls for early spring pinks, greens and robin's egg blue. 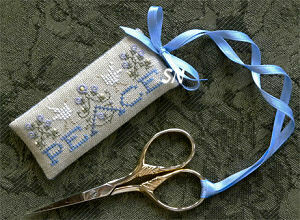 PEACE used icy blues, grays and white. 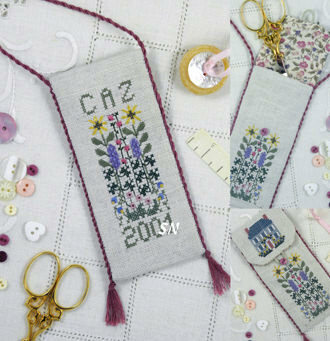 Each Tag is offered as its own chart, with GREAT stitch diagrams! Cynthia has it counted all the way to stitch # 144! ), Ringed Backs, Diagonal Fillings... I love all the diagrams! Then, the entire piece is framed with a Drawn Thread Four-Sided Stitch Border -- and you get great instructions for that technique as well! Offered as the chart, a yummy confection to devour with your needle!! The Drawn Thread has three new releases... and since Halloween will soon be upon us... I chose this one to highlight! Spell out Halloween with a flourish of cute motifs and fun colors... this finishes ONLY 11 x 1-1/2 inches on 32ct! The bats are stitched in Satin Stitches, and the spiders are actually two tiny black buttons with legs. Cute, and quick, this would be cute as a long cube to sit on a windowsill or shelf! Offered as a chart, stitched in DMC and overdyed flosses. 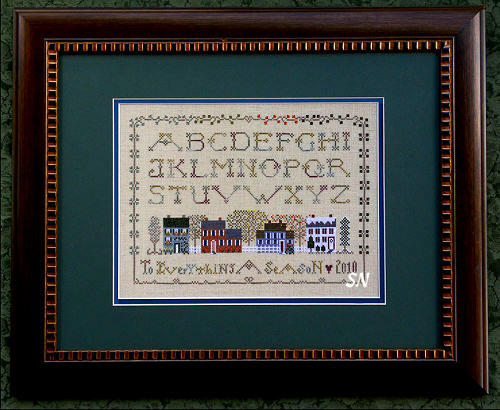 A small neighborhood of houses, all through the seasons -- this measures 178 x 121 stitches -- or approx 11 x 7-1/2 on 32ct. 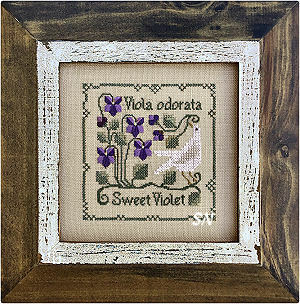 Cynthia has tucked in a few Horizontal Smyrnas, Crossed Cushion and Satin Stitches, but for the most part, this is simple Cross Stitch. Charming... don't those trees *just look like* Drawn Thread Trees??? 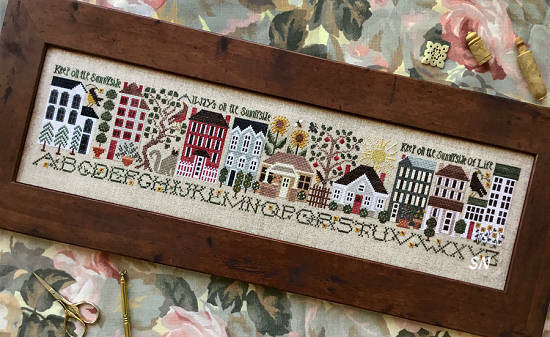 I think this would make a nice housewarming gift -- just add some house numbers or family last name -- the lower sides of the border give you lots of opportunity to extend and add a row or two. Offered as a chart, charted for Needlepoint Inc Silks -- you may want to raid your overdyed floss stash a bit! Cynthia calls this an ornament! 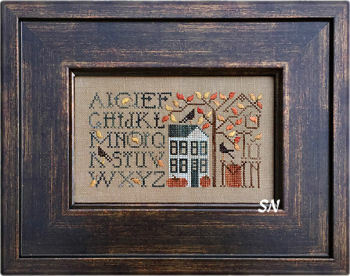 Finishing approx 2-3/8 x 5-3/4 on 32ct Laurel Linen, this beautiful little thing features almost NO Cross Stitches at all! 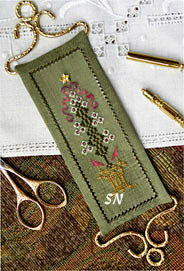 Satin Diamonds, Broad Diagonals and Overlapping Crosses, make up the 1 x 3 miniature tree in the center!!! Find a crystal star for the tree topper and garnish the 'branches' with a few beads. Next, threads are removed and Hem Stitching applied... turning under and mitering corners till you're finished. 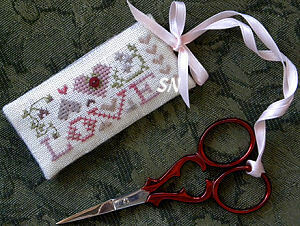 See the pair of embroidery scissors in the picture? Gives you size perspective! Offered as a chart, this is coded for silk... so choose your Belle Soie, or some pretty hand-dyed cottons if you'd rather. Drawn Thread has three new designs... Friendship Garden is the largest if the three, that are all offered in chart format. Measuring 69 x 169 stitches, this was originally designed as a Friendship Round Robin stitching piece. 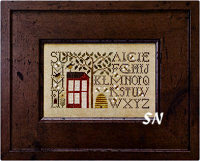 There are six tiny empty spaces in the inside area of the design, each with a corresponding garden, and alphabet template. 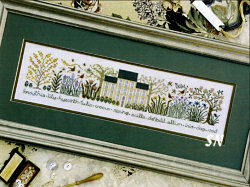 Each stitcher in the RR can initial her garden area... and the owner of the sampler can stitch her own border! All the border greens are different, and each of the tiny interior gardens are stuffed full of specialty stitches. 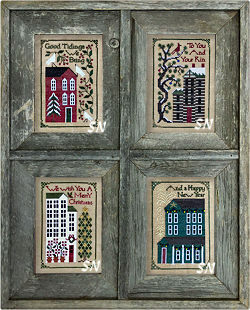 This is a charming set of 4 tiny seasonal samplers... each is a mere 52 x 52 stitches in size. 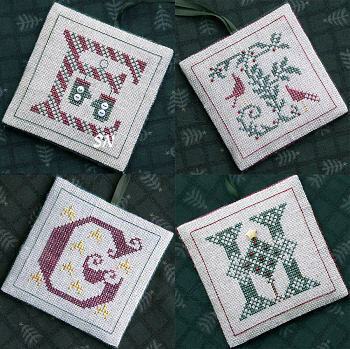 The season is spelled out around the borders, and then, four TINY motifs fill the centers -- they're only 10 x 10 stitches -- so start thinking OVER ONE THREAD here... and these would be AWESOME! Each sampler features specialty stitches in it's petite area, it's hard to see the colors from the chart's cover photograph... but I'm sure your stash has *tons* of lovely threads for these!!! Offered as the chart of 4 seasons. 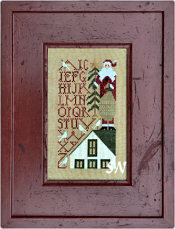 Cynthia Z has a charming little Santa Claus pattern... I believe he is a limited to 150 edition chart... and we think he's great! Santa is climbing down the chimney (his sack is still full, so we think he's on his way down...) With a stitch count of only 47 x 47, he finishes perfectly as an ornament. Offered as a chart, it calls for threads we don't carry, (I am sorry to deliver that news)... BUT, BUT, BUT, my gosh, you have tons of great options in your stash for this! Find your reds, greens, golds and a little White Wisper and you're set! Fun, specialty stitches tucked in here, too! The Drawn Thread has 3 new releases... and I thought this one was too cute to pass up a spot on Just Arrived!!! 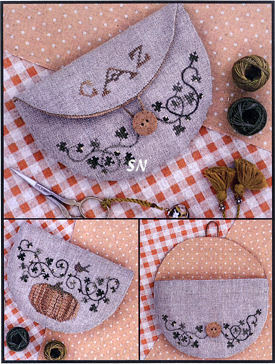 The Pumpkin Pocket is actually a round piece that is folded into a scissor or thread pocket! 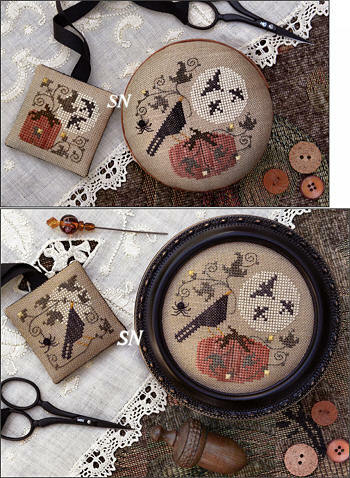 VERY SIMPLE stitching... the pumpkin is worked with lots of Long Stitches, and the vine is Wrapped Backstitch. Threads called for are hand-dyed... so get out your stash... and choose favorite colors! Pick a fav fabric, and finished size changes as well! Offered as a chart. This is an AMAZING study of 44 different Pattern Darning Designs!!! EVERY SINGLE stitch in this is either horizontal or vertical... each lays above, below or intertwines with it's companions to create woven design. Darning was used to repair fabric when there were holes or weak areas... and this showcases 44 different patterns one would have used!!! 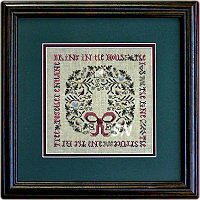 Offered as the chart, this is stitched on 32ct Antique Ivory Belfast Linen and measures 11 x 11. It calls for only 5 colors of DMC or Silks... 520, 522, 612, 902 and 3726... check out your hand-dyed silk stash for an accent color!!! Perfect for a teaching/learning/practice piece! A TEENY wisp of a design, the stitch count on this is only 29 x 63... so if you did it on 36ct, it'd be only 1-1/2 x 3-1/2 inches!!! Pick anything... this is a sweet, quick-stitch thing! Drawn Thread has two new pieces -- along with Cottage Garden (a scissor case), Carnelian Rose is a biscornu cushion and miniature matching biscornu scissor fob. Stitched on 32ct Stoney Point Linen in Dinky Dyes and Thread Gatherer hand-dyed silks, both pieces are embellished with 3, 4 and 10 mm carved Carnelian Gemstones of a light tomatoe-y red/coral color. The fabric and silks are a luscious blue-green, and the featured special stitches are easily executed for lots of texture. Main design is only 60 x 60 stitches, the little fob is a mere 36 stitches square. 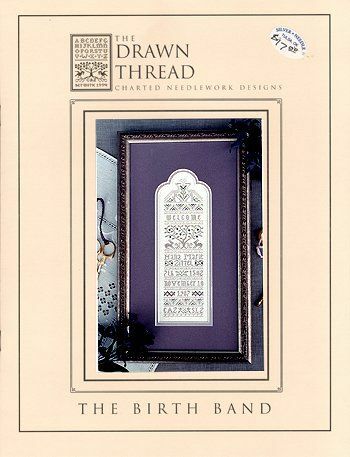 Offered as the chart or complete kit of linen, silks and embellishments. 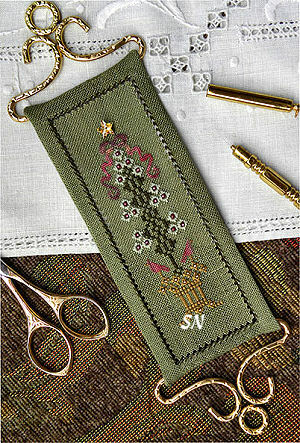 A charming piece, originally stitched in 2001... this is a tiny floral band sampler that is finished into a 2 x 4-ish inch scissor pocket. VERY quick stitching, there are lots of specialty stitches in here, and a lovely selection of cheerful Springtime floss colors, too. Even if you don't make the case, this small design would be lovely worked over one, and exquisitely framed! Offered as the chart. 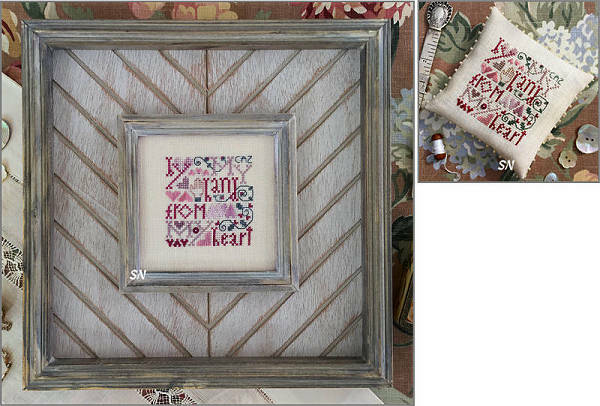 The Drawn Thread has released two new designs -- this is just one -- click the pic to see The Language of Love! 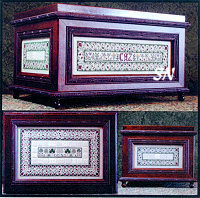 Anyway, this sewing chest design is intricate and lovely!!! 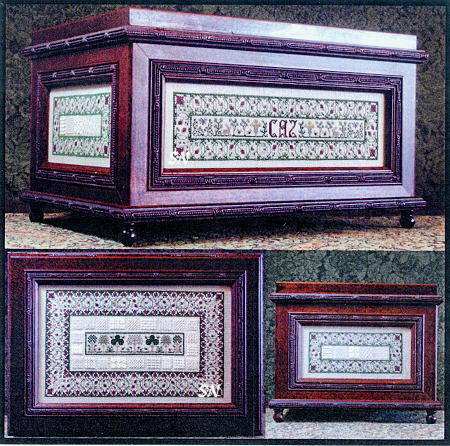 Designed to fit one of Olde Colonial's Chests (we have 'em IN STOCK), each of the sides features a very busy border of vines with tiny panels of specialty stitches -- all done in Whitework. The top features more of the same... with a Grand Presentation!!! 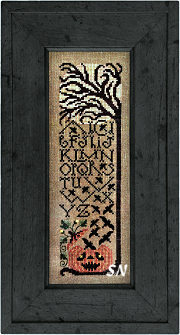 Offered as a chart, this is coded for either silks or DMC flosses, and worked on 30ct linen. In paging through the instructions... I get goose bumps!!! There are so many 16-thread areas PACKED with 1-inch stitch samplings... I LOVE this kind of stuff!!! ... Cynthia's charting is so clear, you get the stitch progression numbers, along with a composite stitch diagram of the entire 1-inch block ... all the borders, all the bands, the trees that are featured in the top compartment of the chest are stitched over one. The 13 x 9 x 7 1/2 inch chest is really *pricey. 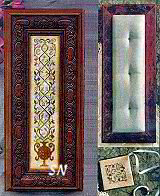 * (Hand-made of beautiful mouldings... IT isn't expensive... price is just relative to your stash budget!!!) So... if the $400-ish for the chest simply isn't meant for you... just do the pieces and assemble them into needle cases, cubes, and framed pieces. 'No chest' is 'no reason' not to stitch this!!! 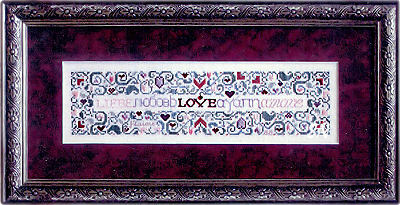 A pretty design, that spells LOVE in 5 different languages, the heart trellis border surrounding the center section is a study in different hearts that are stitched with specialty stitches! I counted 18 different little hearts of cool stitches... but I bet there are more. The entire piece is stitched in various silks -- this is not charted for DMC -- so you *may* get to choose your own colors! Stitched on a 30ct, this finishes approx 13 x 3. 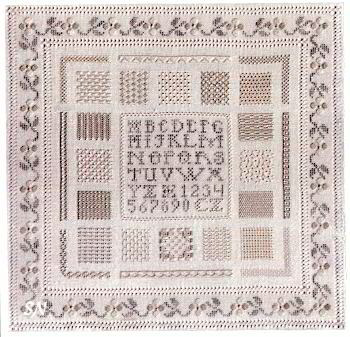 Obviously, changing fabric count will alter size... this would be lovely on a pale pink, you could choose a taupe... do it in the colors of your wedding, and personalize it... it does include an alphabet. 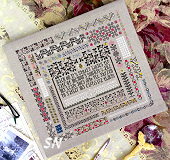 It's very pretty, the charts are huge in the leaflet, so it looks like it's going to be really fun to stitch! Offered as the leaflet. These pretty flowers are climbing the garden trellis, ready to carpet the entire garden in a sea of brilliant blue! Loaded with Morning Glory flowers, this piece highlights them using the Jessica Stitch -- 20 long stitches all chasing each other around a tiny circle to form a very 3-dimensional flower. 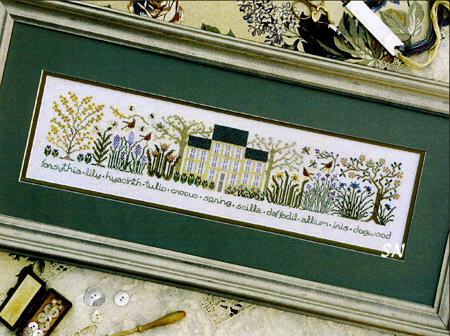 Satin Stitch leaves throughout, and an Eyelet Herb Garden at its base, this piece measures a petite 2 x 9 on 32ct. Offered as the leaflet. Toccata #4... In 3 Parts! 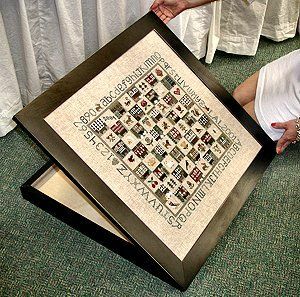 Cynthia Zittel has, once again, delivered us an exquisite needlework design... a 'Toccata'... a trophy... a showcase piece for your stitching talents!!! 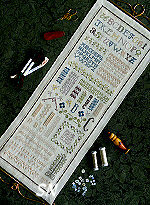 Just like the three before it, Toccata #4 is full of small areas of specialty stitches. You sample one, then go on to another. The possibilities with something like this are ENDLESS! Offered as charts, the entire piece finishes approx 13 x 18 on 32ct Vintage Country Mocha Belfast Linen -- each section just 4-ish x 18! We are offering a 'fat third of a yard' Cut for this... it gives you 4-1/2 inches of linen around each side, and is actually a more economical cut than the specified 20 x 24 cut... and it allows you lots of extra linen to make those ornaments and fobs!!! 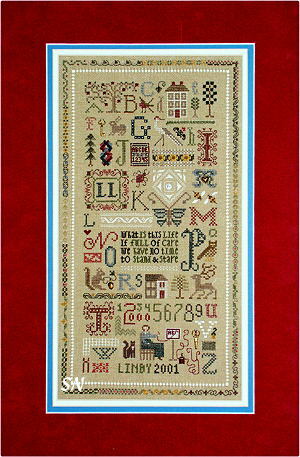 This is a charming sampler that tells us the story of a man, 'who some did count as mad... the more he gave away, the more he had.' Stitched on 32ct this finishes approx 7-1/2 x 18-1/2. I know someone like this, I imagine you do too... kind of humbling. Finishing approx 12 x 12... you'll be stitching 11 different borders and 16 specialty stitches that will present you with an heirloom when you are finished! 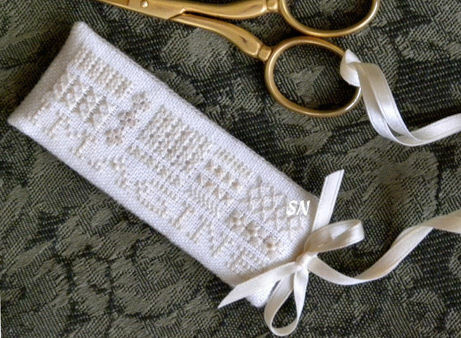 Gorgeous, glistening threads, exquisite textures from the stitches, you'll be able to follow all of it all the way through, because of the huge stitch diagrams outlined step-by-step in the 10 pages of instructions. This is one of those patterns that is simply FUN to page through over and over again -- even if plans of starting are long-away in the future. So balanced, so subtle in color, so worth your time!!! 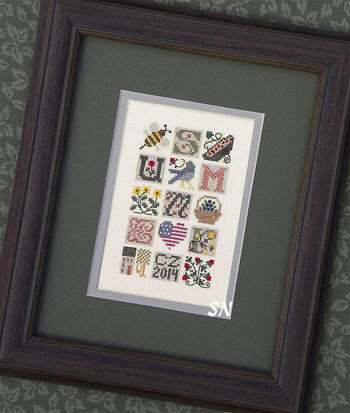 This is so, so, so cool... it is a spot motif sampler -- full of special stitches -- that has almost 40 different areas for you to CHOOSE AND PERSONALIZE the Souvenirs of your life!!! Available as a 14-page booklet with pull-out charts, stitched on 32xt Flax Belfast Linen, and measuring approx 8 x 12 when completed... this is just amazing!!! Silk or DMC floss colors of greens, blues, mauve, white, gold and dark brown, the possibilities are endless with this pattern! 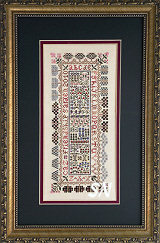 The main chart features the alphabet and selected sampler motifs. 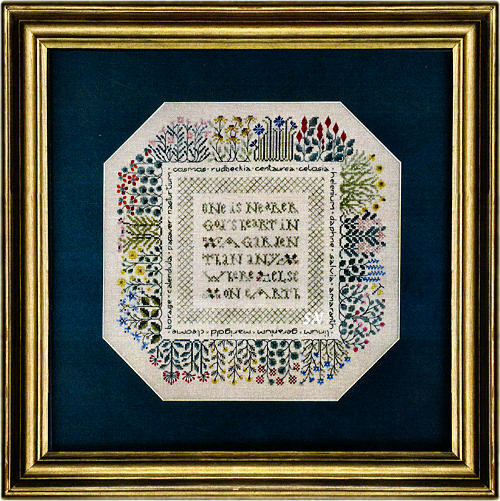 A reproduction by The Drawn Thread, this was originally stitched by a 12 yr old girl in 1844. (We feel so sorry for these stitchers of old... they were always worried about death, living a worthy life, and reminding their readers to remember someone!!! I know that this is part of sampler history, so it's not something to make light about... it just never seems too cheerful!) 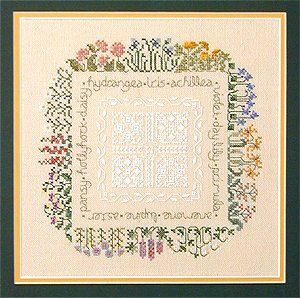 Catherine's sampler was beautifully executed in silk and wools and is now worked on 28ct Natural Linen Silk fabric in Medici Wools and Needlepoint, Inc silks. Colors concentrate on tans, creams, olive greens, black-brown, golds and rusts. I do like that border of white magnolias... it's bold and balanced. Available as a leaflet. 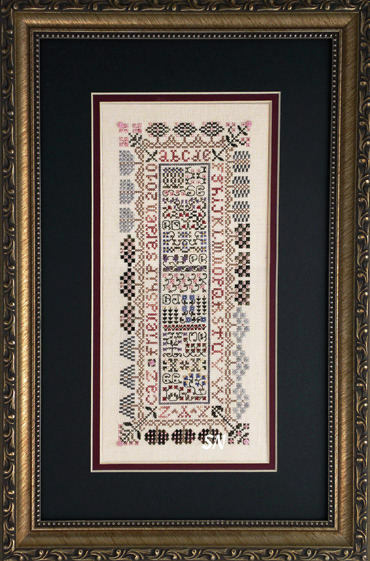 A spectacular piece designed to be a 'touch piece' -- a smattering of 39 specialty stitches -- Toccata will showcase your needlework talents beautifully!!! Cynthia describes it as 'intricate and challenging! 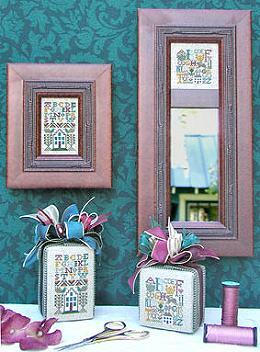 Stitched in luscious shades of teal and dusty green, the mauve color family is the DMC set of 3041 and 3042. Touches of taupe, lots of gold metallic and overdyed gold floss, along with ecru perle cottons this is simply too exquisite for words!!! Finishing approx 10 x 10 on 36ct Edinborough Linen, you'll be working with silks and Japan metallics executing so many cool stitches... while creating this spot motif sampler. The pattern is offered in a full-style book format, with the master chart being a 17 x 22 sized single sheet of paper... tucked into the 18 pages of stitch diagrams! Guilloche, Rounded Sheaf, Florentine, Tied Trellis and Herringbones, Interlaced Diagonal Cross, Pekinese, Laced Diamonds, Threaded Algerian Eyes, Ringed Backstitching, Lots of different couching techniques, and of course, a few cross stitches... this is just a treat to page through... and dream of starting!!! Offered as the pattern, we have linen and threads available as well. Your choice of linen count, the threads offered include Needlepoint Inc Silks, Kreinik Japan Golds, Weeks overdyed floss, and perle cottons. Gold beads and heart charm are included with the pattern. 'Wisdom tells me I am nothing... Love tells me I am everything.' 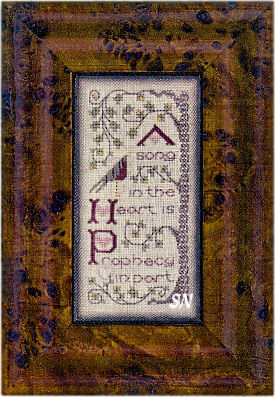 What a neat verse tucked into this incredible band sampler that features something like 40 specialty stitches! (I lost count paging through all of it!!!) Stitched on 32ct Lambswool (or 28ct Flax... or a Country French color... this has TONS of possibilities! ), the silk colors are moss greens, teals, golds and brick. Finishing 5 x 19 on a 28ct, the detail in this is awesome! 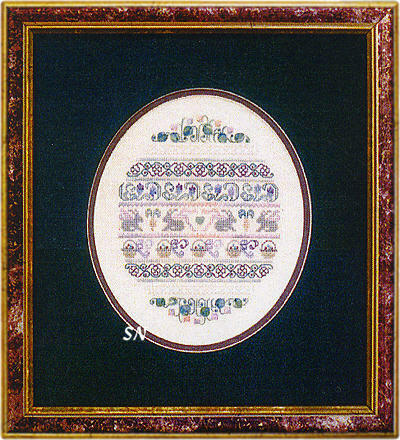 Each border motif is stitched in unique specialty stitches, which are diagrammed in the 7 different pages. The main chart is a pull-out piece that measures 11 x 22... and the whole thing is just YUMMY!!!!! Jacquard, Bosnia, Darning, Eastern Stitch, Laced Double Back, Mexican, Norwich Quodlibet, Pekinese, Rug, Shell, Tete de Boeuf, Vault, Web Stitches... get the idea??? This is packed full of fun challenges and neat textures!!!! Totally awesome!!!!! Available as the chart, we have the silks and linen available individually if you need them. Please specify what count of linen you'd like... all the Flax, Lambswool and Country French colors will do beautifully, so please let us know if you have a preference! This will be a challenge to describe with just a few words! To quote the designer, Toccata has been designed to show off an individual stitcher's skills, and for learning, practicing and improving needlework skills. Available in a 22-page booklet, this piece features 18 different border designs, and 35 different blocks of specialty stitches in all sorts of different stitching techniques! Elegant colors of olive, light and dark bricks, blue-greens, and ecru... it features flosses, silks, perle cotton, and some Caron Collection Wildflowers. Finishing approx 7 x 9 on 32ct Antique Ivory Linen, the model is stitched using the floss colorway, which includes DMC's Sampler Threads, Weeks Dye Works floss, #8 Perle Cotton, and touches of Wildflowers. 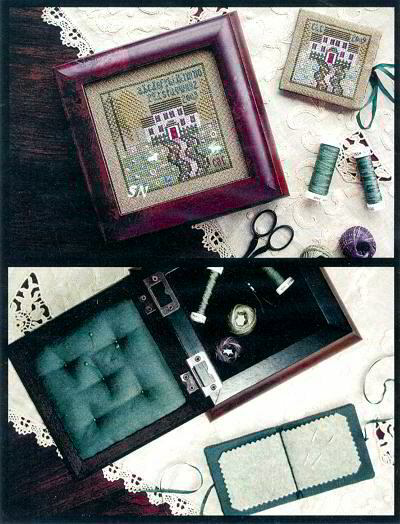 This tiny creation is absolutely breathtaking... and the book is a stitcher's dream just to look through! Page after page of diagrams, each border is presented individually, followed by each of the 35 different blocks. I love all the stitches, all the textures, all the tiny details tucked everywhere! Each tiny block is only 1/2 an inch in size... and surrounding all of your talents is the beautiful hem-stitched border that is also diagrammed. Choose between flosses, silks, or a mixture of both threads! Absolutely awesome!!! Simply stunning, this sampler will quickly become a family heirloom to be treasured! Based on a Shakespeare Sonnet, the verse speaks of love and the commitments of marriage over time. Perfect for a wedding or anniversary sampler, and finishing approx 8 x 26 on 32ct Natural Linen, the design is stuffed full of special stitches, and is worked in lots of green, raspberry, cranberry and burgundy, warm browns, soft golds and creme. Choose between flosses, silks, or a mixture of both threads! Along with all the beautifully presented stitch diagrams comes the entire chart... on one continues piece of paper that measures 11 x 34 inches! (No guessing where the pattern repeats from one page to the next! It's all here in one chart for you!) Beautifully presented, full of details and wonderful sentiment! This is a breathtakingly beautiful design, absolutely stuffed FULL of special stitches (I lost count at 36!) and wonderful design elements! Stitched on 34ct Linen, in creme, mauve, green, rose and aqua silk threads, the embellishments included are tiny pearls, and glass seed beads. In opening the pattern, you'll discover the chart, which is printed on an 11 x 34" sheet of paper, along with a 12-page booklet diagramming all the fun stitches. Just beautiful, this is one of those patterns that you can just look and look through, dreaming of the lucky day you'll start it! The chart and diagrams are really well done... I just might have to do this one!!! Included is the chart, pearls and beads. Oh, Oh... I love these! Two rinky-dinky delightfully detailed little samplers... the smaller one is only about 1-1/2 inches square!!! 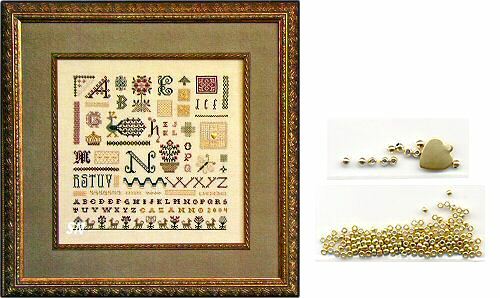 The picture on the chart cover places these next to a spool of Kreinik Metallic... and one is the same size! How little is that!!! DT has finished these into mini-stand-up cube shapes, and they're a must! This is the newest from Cynthia. It arrived a few weeks ago, and is such a neat design, we decided to feature it for you! Stitched on 32ct Summer Khaki linen, in beautiful deep shades of green, teal, rose and taupe silks, the entire design finishes approx 7 x 13". It's full of neat little motifs and borders, and TONS of fun stitches! Every time I look at it, I see something I missed before -- it's really neat! Linen is available separately, if you need it. 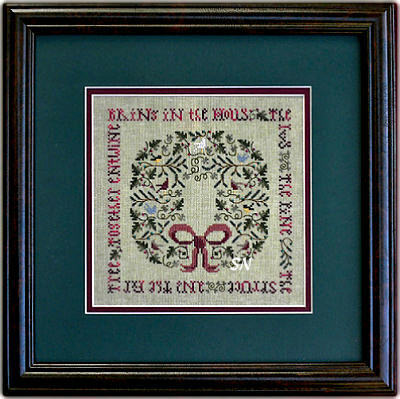 An elegant birth sampler, this is stitched with one ply of Needlepoint Inc. brand silk, on either 35 or 40ct linen! (Because the fabric is not included in the pack... you really can use whichever is your personal favorite!) Worked almost entirely in creme, there are touches of the softest shades of lavender and moss green silks that set off the special stitches used. 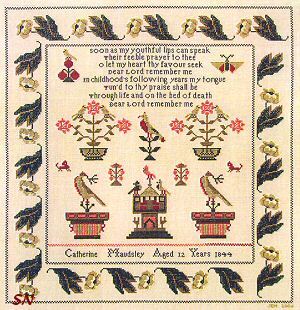 Just a really sweet birth sampler, there is plenty of room for birth information, and several small motifs to use to fill in any empty spaces you need to fill! Beautiful! This is an absolutely breathtaking herb garden design! Available as a chart, it finishes approx 11 x 14" on 32ct linen. 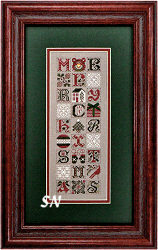 It has a beautiful assortment of colors: Needlepoint Silk, or DMC floss, your choice. I lost count after 25 specialty stitch diagrams... and noticed the entire page of instructions devoted to the hemstitched sides, and mitered corners she's done as the finishing. The design is full of charming herb garden foliage and creatures... there is so much detail, even the chart (a whopping 17 x 22" sheet of paper!) is a treat to look at! You can't pass by this one!!! This is a charming checkerboard design, that when stitched on a 25ct, finishes 16 x 16." 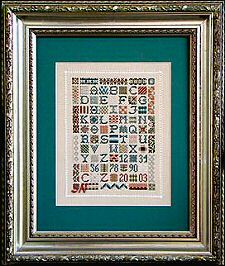 Each square alternates a sampler motif with a little house, and all of it is surrounded by an alphabet. Pretty, colonial colors of Blue-greens, taupe, forest greens, old roses and golds, and gray-browns, it'll be a lot of fun to stitch, because each square is a teeny finished project of its own! Alpine Garden is stitched in yummy shades of creme, slate, moss, and rose silks. The motifs include all sorts of pine trees and 'mountain-y' wildflowers. Companion to Wildflower Garden and Cloister Garden... this one is so serene... it makes me want to take a trip to the mountains! This one is the companion to "The Cloister Garden." It has beautiful deep green shades of thread, and lots of pretty detailed flowers in its bands. Finished size approximately 4" x 15". It's awesome! 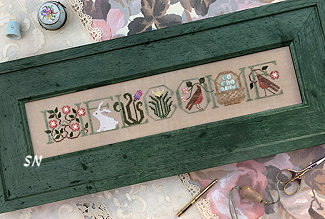 Part of Drawn Thread's Garden Series of band samplers... this one is a charming herb garden. 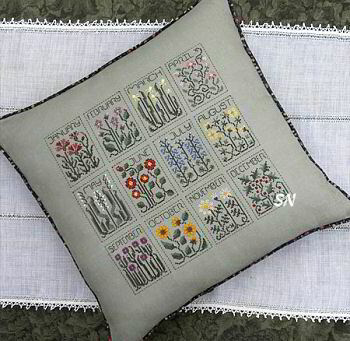 Full of delicate herbs you'd grow in your garden, this one is stitched on Lavender Mist linen, so it has a pale lavender feel to it. Just touches of all sorts of pretty little flowers, you never get tired of stitching them... because you're off to the next one so quickly! This is soooo pretty! A wonderful white-worked garden in the center, this is surrounded by teeny perennials all around! 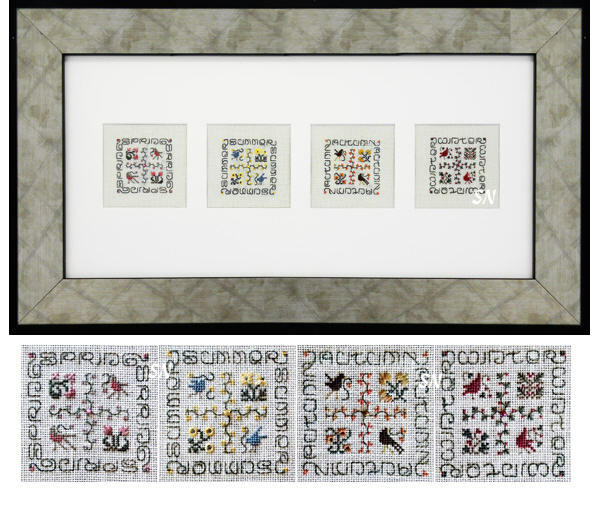 There is no top or bottom to the design, so you can hang it any which way you like! It's beautiful finished as a pillow, too, because it'll never be upside down on your couch!!! Finishes approx 7 x 7" on Putty or Platinum 28ct linen, this one calls for some overdyed flosses to really give it a natural look! 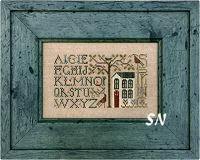 Stitched on antique green cashel linen, this sampler is just beautiful! Predominately greens, yellow and white, it has touches of lavender overdyed silk included for the teeny flower details. Its been a shop favorite since it was released a few years ago! Pretty, restful shades of creme, taupe and greens! Finishing approx 3 x 10 on 32ct... This design is so special, because all the proceeds from its sale are donated to "The Seton House" in Denver, CO. Founded by Mother Teresa, this hospice provides shelter for the sick and needy. The little design is thanking sheep everywhere for their generosity! The verse reads: "Little lamb, My gentle friend, gives up his coat, as snows begin, to make my mittens, scarf and hat, and I stay warm, because of that." Finishing approx 3 x 8 on 32ct putty linen. Soft, restful pines and all the wonderful flowers and what-nots you'll find while on your woodland walk. Stitched in "woodsy" browns, cremes, and greens... so pretty!